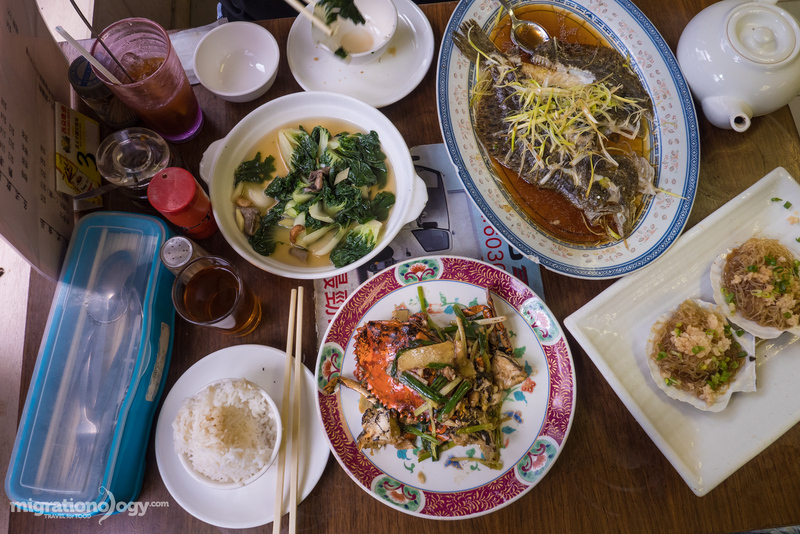 Hong Kong is famous for food, and when you visit, you better be ready to eat. In this Hong Kong food guide, you’ll discover 25 dishes and snacks that you don’t want to miss eating when you’re in Hong Kong. For each dish, you’ll also find restaurants in Hong Kong where you can try them. 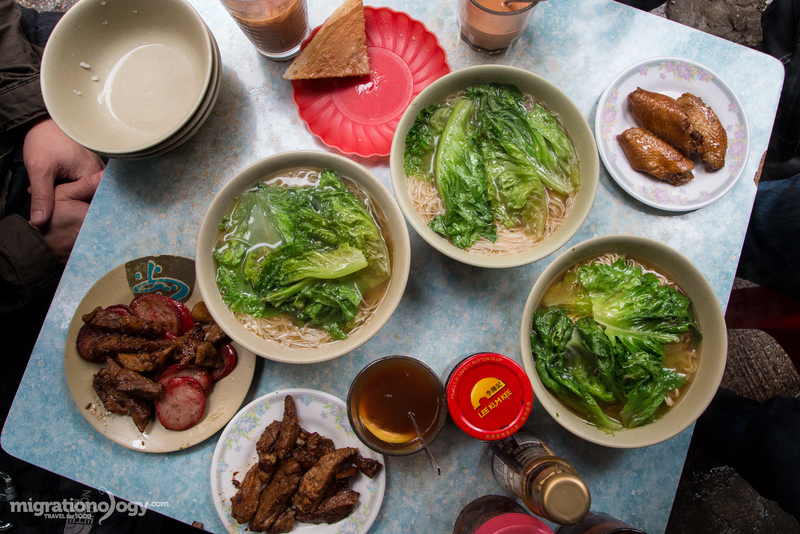 Ok, let’s jump right in and get started with this Hong Kong food guide. 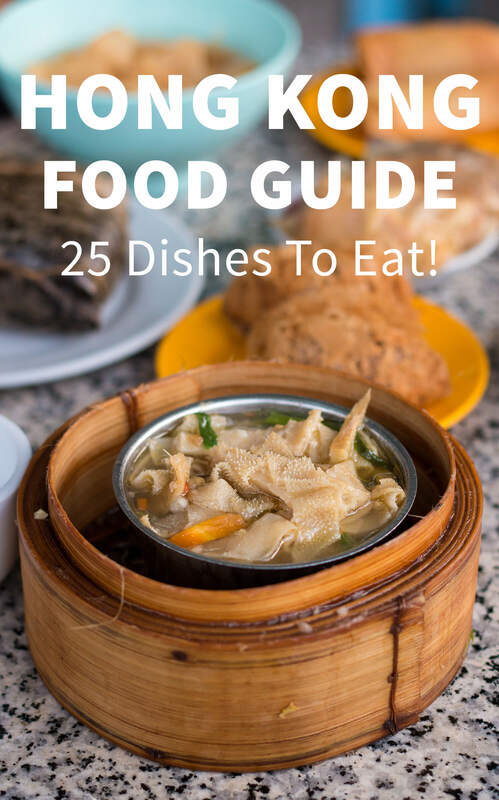 ATTENTION: This Hong Kong food guide is available to buy as an Amazon Kindle eBook or you can download the PDF for free (limited time only). 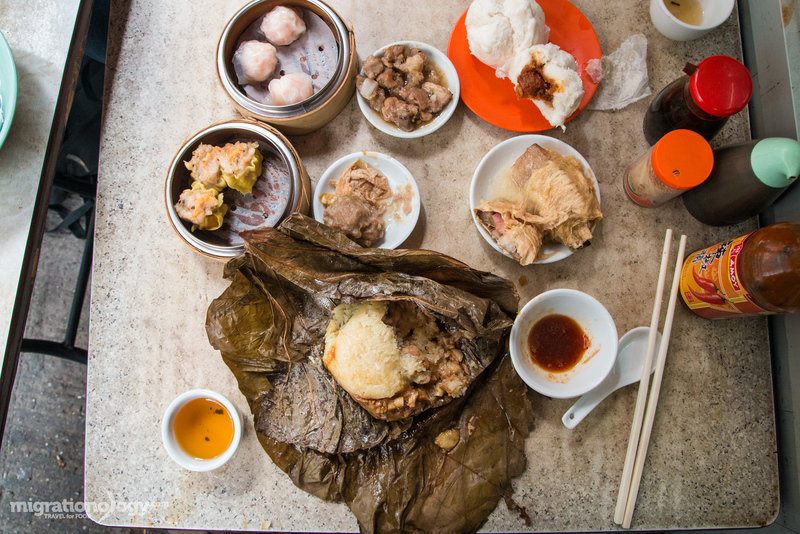 One of the best reasons you should travel to Hong Kong is to eat dim sum. There is an ancient Chinese tradition of drinking tea, known as yum cha, and with tea it’s common to eat little bite sizes dishes which are known as dim sum. That’s why dim sum is often served at teahouses and always goes with hot tea. For this Hong Kong food guide, for the sake of not mentioning dozens of common dim sum dishes, I’ll include them all under this single dim sum category. 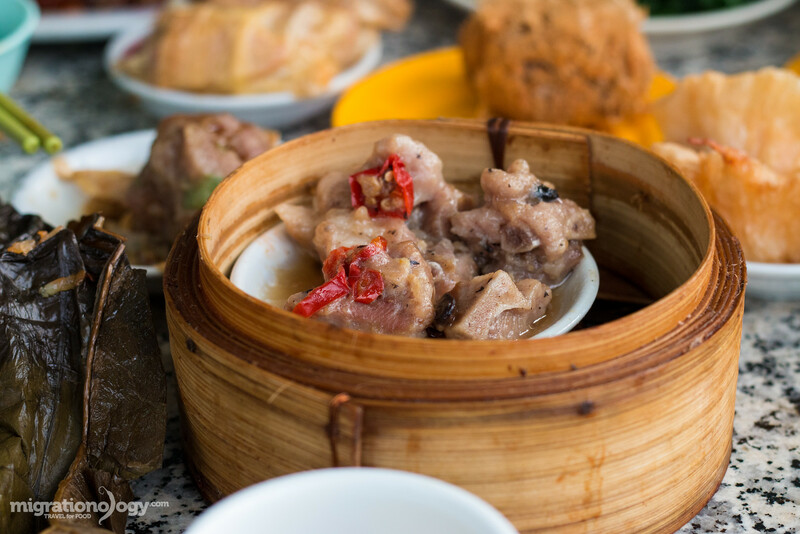 Dim sum can range from braised chicken feet, to porky siu mai, to shrimp filled har gao, all guzzled down with hot tea. Not only is dim sum one of the most famous foods to eat in Hong Kong, but eating dim sum is one of the most fun and delicious food experiences you can have. 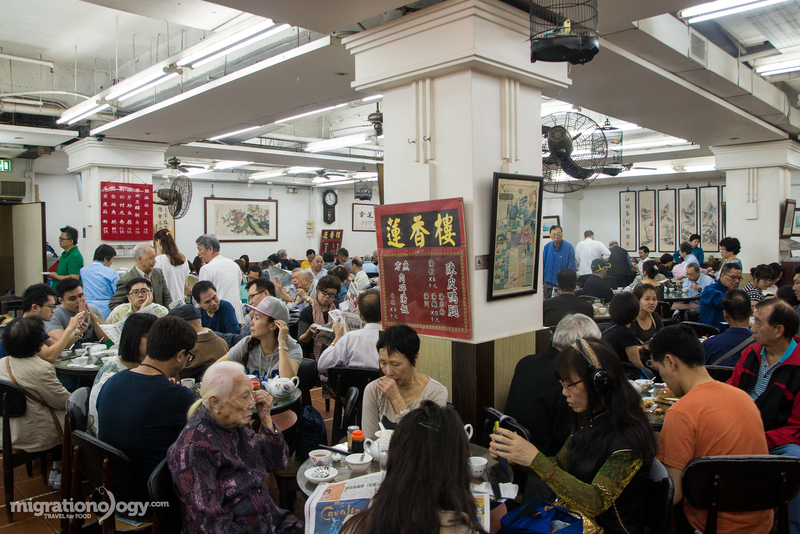 Recognized for holding true to its traditional style, and rated by CNN as having the best dim sum atmosphere, yet right within Hong Kong Central, Lin Heung Teahouse is one of the great experiences in Hong Kong. It’s a dim sum teahouse where you have to be aggressive, and you may not get all the dim sum dishes you wanted to try, but the ambiance, communal tables, and constant loudness and chatter are something to always smile about when you’re downing dumplings. Every time I got to Hong Kong I don’t miss yum cha at Lin Heung Teahouse. This is a classic neighborhood, early morning, dim sum restaurant. Thank you originally to my friends at FoodieHub.tv for this recommendation. It’s just a small place and all the bamboo steamers are at the front of the restaurant and you just choose whatever you like. Located on Hong Kong’s Chuen Lung mountain, just outside of the main city edge of Hong Kong, this family run teahouse serves some of the ultimate Hong Kong dim sum. My friend Will from Hong Kong took me here, and though it’a bit of a food mission to get here, every bite makes up for it. Don’t miss any dim sum that looks good, and the old-school roast duck and char siu is also superb. Lo mai gai is typically served at dim sum restaurants in Hong Kong, but I just had to include it on this list as its own standalone dish because it has been one of my must eat favorites since I was a kid in Hawaii; It’s pure comfort food at its finest for me. 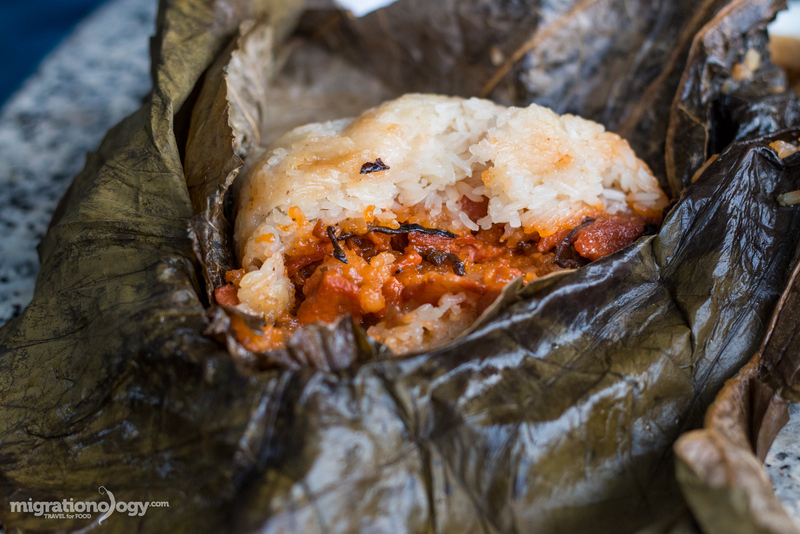 Glutinous rice, plus a combination of chicken and pork, and sometimes Chinese sausage, is steamed within a lotus leaf until the entire packet becomes gooey, the flavors all mingle together, and the lotus leaf embeds its fragrance into the rice. Just thinking about lo mai gai and writing about it makes my mouth water. I like to eat it with some chili sauce, and as long as I get a packet of lo mai gai at a dim sum restaurant, I’m happy. Lo mai gai is available at any dim sum restaurant. Refer to the Hong Kong dim sum restaurants listed above in #1. Few foods in the world, I’m talking to you Kobe beef, can compare to the excitement that you will have from the anticipation of eating Hong Kong roasted goose. 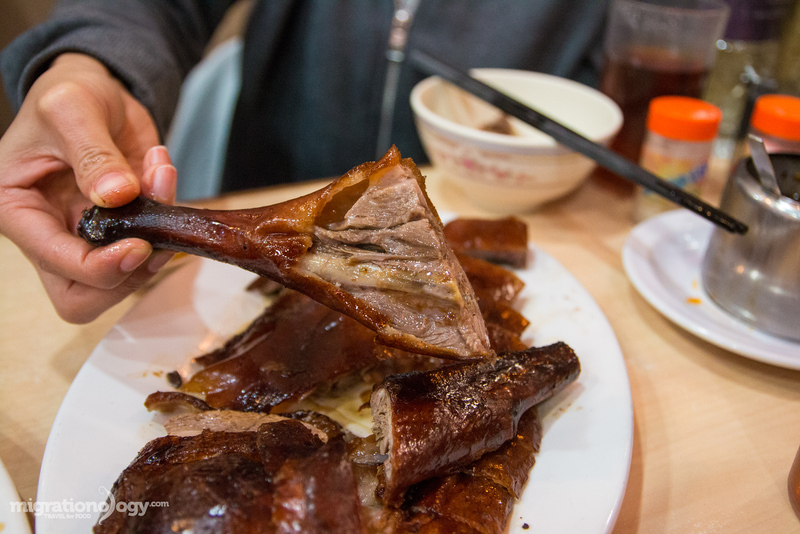 Marinated in a blend of secret spices, of which some recipes include over 20 different spices and aromatics, then roasted using charcoal until golden crispy perfection, roast goose is must eat in Hong Kong. When you take a bite, literally the skin juices in your mouth, while being incredibly crispy at the same time and the meat is lusciously succulent. 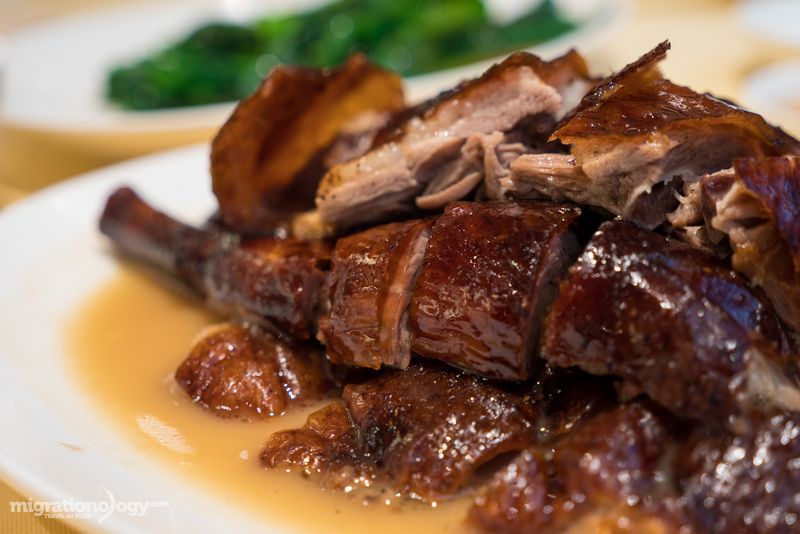 One of the go to restaurants for roast goose, and also a One Michelin Star restaurant, is Yat Lok, which I think serves some of the best roast goose in Hong Kong. I ate there with my wife and a friend from FoodieHub.tv, and we thought it would be a great idea to order an entire goose. It was. But I think in moderation would have been even better. 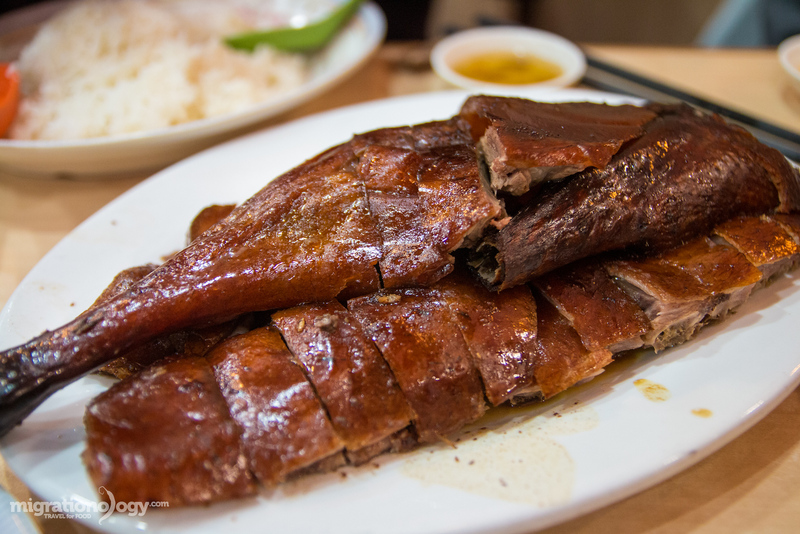 One of the most famous restaurants in Hong Kong that serves roast goose is Yung Kee (鏞記), a restaurant that has a lengthy history. Their goose is high-end, and I loved it almost as much at Yat Lok. Prices: Prices at Yung Kee aren’t cheap, you’ll likely spend 200 – 500 HKD per person. The bill for my wife and I came to 654 HKD for our full lunch with a few other dishes. We’re still not through with the different types of Cantonese roast meats in this Hong Kong food guide! How could I not include roast pork? Roast pork, usually the belly of the pig, is roasted until utterly crispy on the outside skin, yet creamy and soft from the high quantity of fat on the underside. The result is simply one of the most superb bites of anything you could possibly eat. 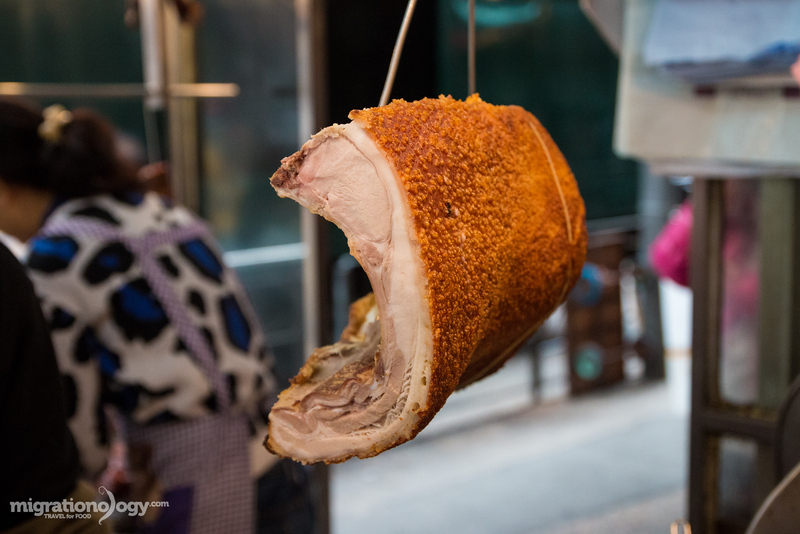 Typically in Hong Kong you’ll find roast pork at any roast meat shop throughout the city. You’ll see some hanging chickens, char siu, possibly some ducks, and then a few bellies of roast pork. It’s delicious to eat on its own, but even better over a plate of hot rice. 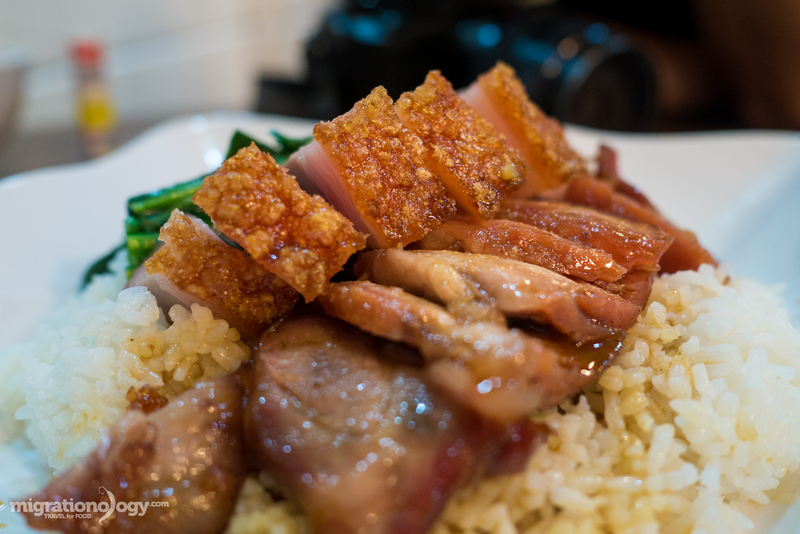 This Hong Kong roasted meat restaurant at Quarry Bay serves the best roast pork belly I’ve had in Hong Kong. 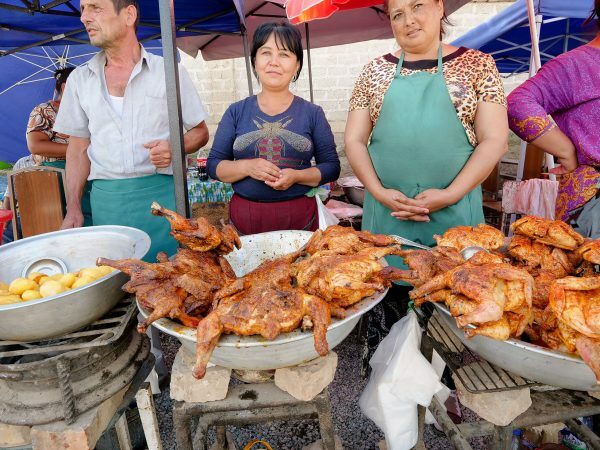 They also have incredibly good boiled chicken, and their ginger scallion sauce will wake up every taste bud in your mouth. It cannot be understated the talent and skill in which Cantonese have the ability to roast meats. 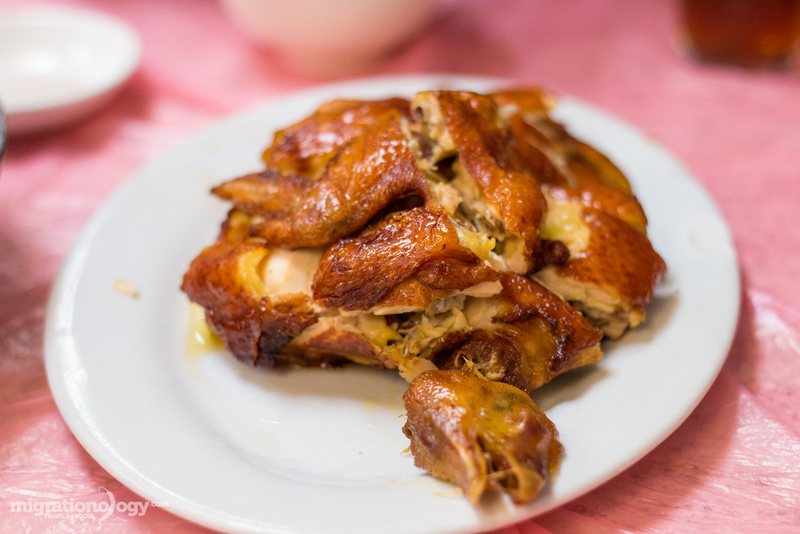 Another classic in the Cantonese meat department is roasted chicken, which has similar properties to roasted goose, but of course it’s chicken, and it usually has a lesser spice marinade to it. The Cantonese style roast chicken can be so crispy and so oily that it actually tastes like it’s deep fried chicken, rather than roasted. The skin is crispy and slightly chewy, while the chicken meat remains moist and juicy. Sometimes you dip roast chicken into fragrant salt for extra delicious flavoring. 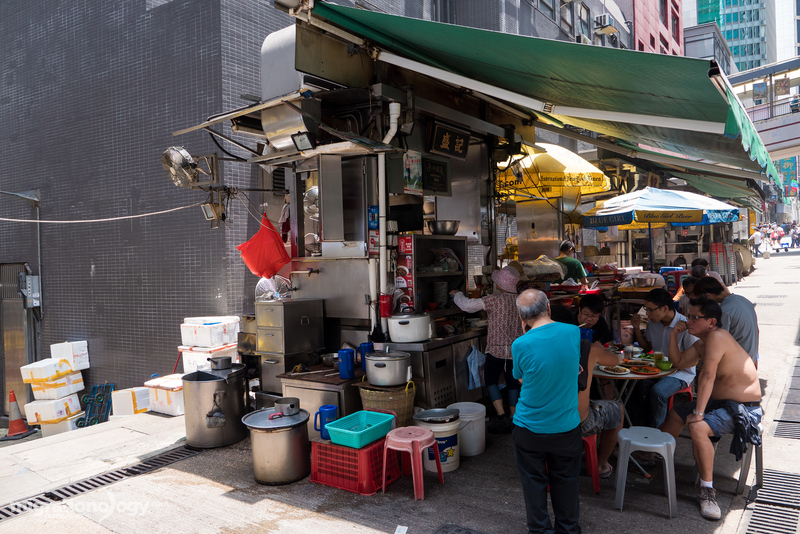 On one of my trips to Hong Kong, after reading this blog post about the Bowrington Road Cooked Food Centre (thank you to Stripped Pixel! ), I decided it was a place I needed to go to eat immediately. The pure Hong Kong dai pai dong atmosphere was picture perfect, and the food was some of the most memorably tasty food I’ve had in Hong Kong. And while all the dishes I ordered were delicious, the roast chicken is something I’m still dreaming about. It was one of those dishes that was actually too salty and too oily, but it was so unbelievably good, that you won’t stop until you lick the bones clean. 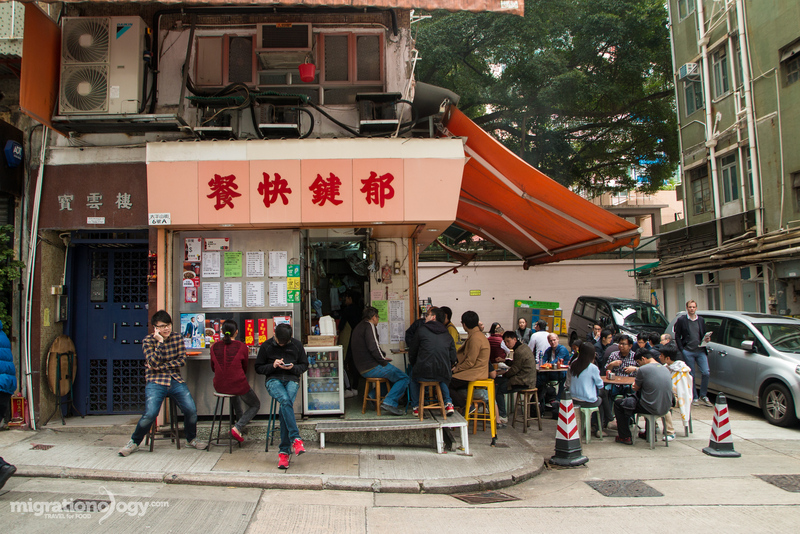 Also, this is one of my favorite restaurants in this entire Hong Kong food blog. Char siu, which can also be referred to as a Cantonese style of barbecue pork, is one of the standard meats at any Hong Kong roast meat shop. The pork is marinated in a mixture of soy sauce, hoisin sauce, honey or sugar for sweetness, and a seasoning blend that includes five spice (here’s an awesome looking char siu recipe). For myself, char siu is typically not my favorite, due to it typically being on the sweet side. However, I have had some delicious char siu in Hong Kong, and when it’s good, it’s really good. 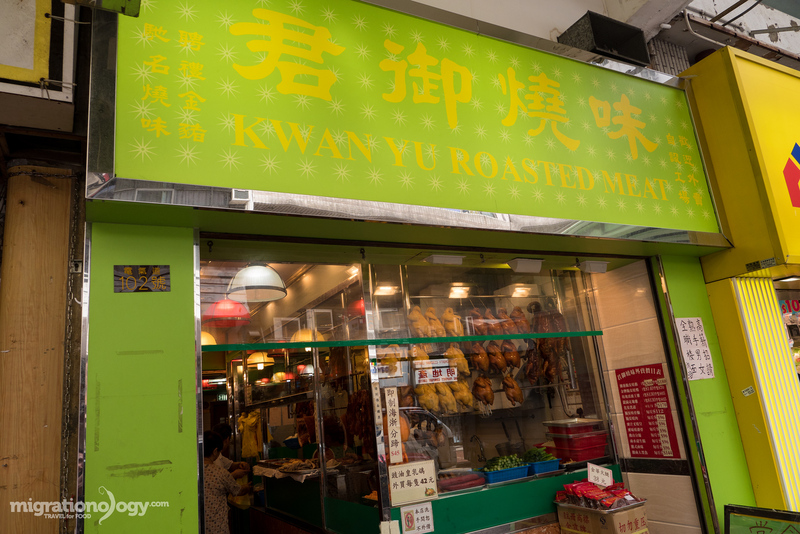 Kwan Yu Roast Meat is a roast meat shop that has all the awesome meats like roast pork and duck and chicken. But along with their braised pigeon (below), I really liked their char siu. Again, it was mainly because it was less sweet than some places, and the flavor penetrated all the pieces of char siu. At many of the roast meat shops in Hong Kong they often also have a few pigeons on display and waiting for you to order them. Roast pigeon is fantastic, but I’m quite a huge fan of soy sauce braised pigeon as well. Similar to duck, pigeon is a dark succulent meat, but in my opinion it’s even more flavorful and richer than duck. Some pieces of pigeon that you eat will have an almost livery texture and taste, and it’s absolutely fantastic. When I was in Hong Kong a few years ago, I ate the famous pigeon at a Fung Lam Restaurant (楓林小館), which unfortunately has permanently closed. I wanted to go to Lung Wah Hotel (龍華酒店) for the pigeon, but haven’t had a chance to go there yet. 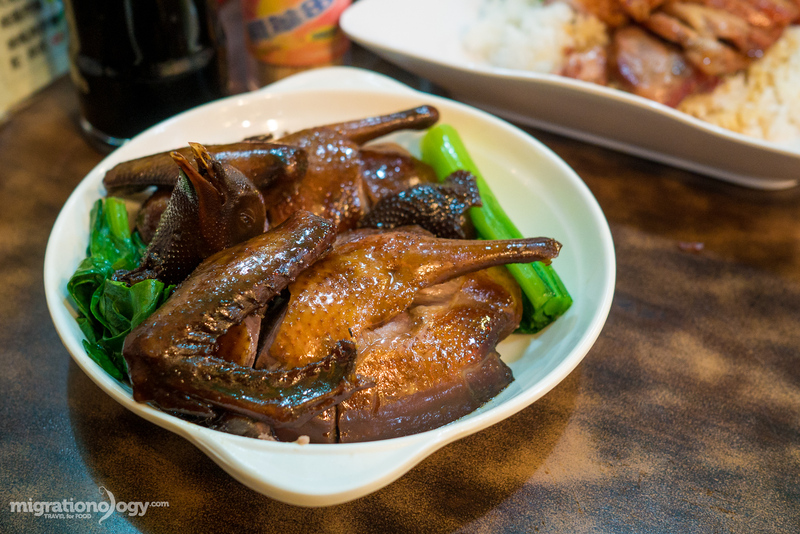 Since Fung Lam shut down, on my last trip to Hong Kong while eating roast meat at Kwan Yu Roast Meat, I saw the soy sauce braised pigeon and ordered one. It was everything I had hoped for and more. Hearing that word alone is enough to immediately make ones mouth water – at least for me. For you too? In Hong Kong there are a number of legendary restaurants that serve beef brisket, tenderly stewed in a variety of Chinese herbs and spices until utterly tender perfection. Beef brisket can be served with a variety of different noodles, in soup, or with a plate of dry noodles. There’s also Hong Kong brisket curry, where the brisket is shredded into flavorful curry and often paired with nuggets of tendon. Whatever your choice, when you travel to Hong Kong, brisket is a must eat. Having withstood the test of time for over 90 years, Kau Kee is one of the most famous restaurants in Hong Kong that serves brisket. 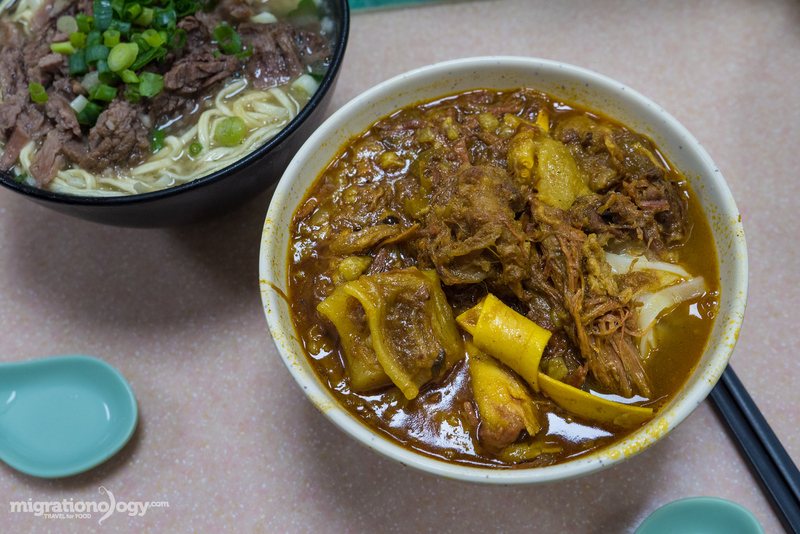 They are well known for two main dishes, brisket in clear soup with your choice of noodles, or brisket and tendon curry. Both dishes are extraordinary, but the curry, with a wonderfully fragrant curry powder taste, while being rich and meaty, is impossible to beat. By the way, don’t let the line outside Kau Kee Restaurant get you down. The line usually moves pretty quickly, and it’s worth waiting for that bowl of brisket curry. 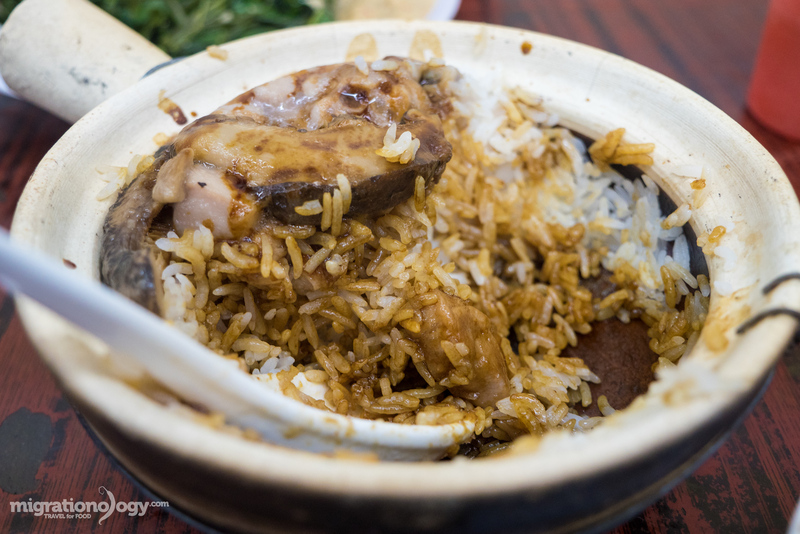 I’ve already mentioned at the top of this Hong Kong food guide that lo mai gai is one of my personal top comfort foods, but claypot rice is a pretty close second. As the name exactly says, rice is cooked (or more like scorched) within a claypot and can be combined with a number of extra ingredients like chicken, pork, Chinese sausage or mushrooms. One of the best reasons claypot rice is so good is because of the sauce that you splash all over it before you eat it, and also because of the fragrant crunchy rice crust that you get on the edges of the claypot. Also, if you happen to visit Singapore, don’t miss the claypot rice at Chinatown Complex Food Centre. Thank you to That Food Cray for this recommendation. Four Seasons Clay Pot Rice is right around the corner from Temple Street, and the restaurant looks something halfway between a food court and a garage. It’s a budget restaurant and they serve excellent clay pot rice. Another classic Hong Kong street food is a pork chop seasoned lightly, possibly brushed in cornstarch, and served with either rice or instant noodles. Although it may just seem like a simple pork chop, the saltiness and ratio of meat to fat, plus being fried in lots of oil, makes it somehow so incredibly delicious. 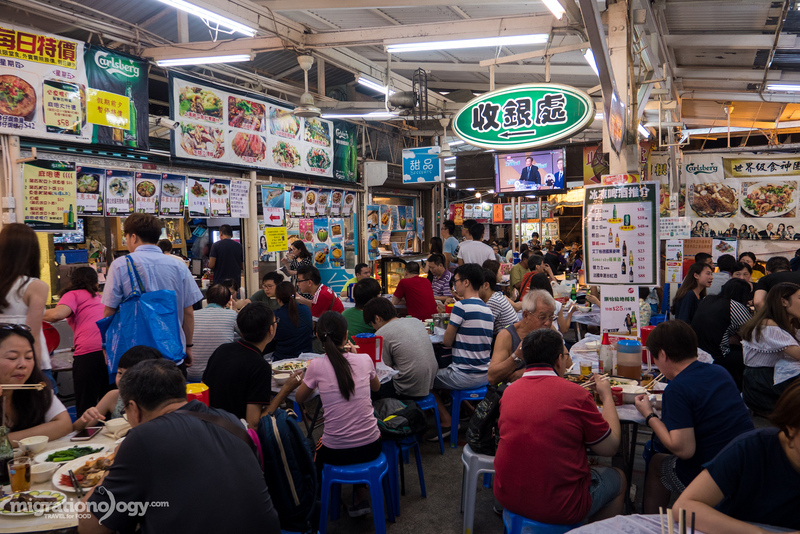 You’ll find Hong Kong style fried pork chops at many different types of restaurants in Hong Kong, but I think the best places to eat them are at local Hong Kong dai pai dong outdoor food stalls. While wandering around Hong Kong one afternoon, we stopped at a dai pai dong for a pork chop snack. The stall is located across the street from another legendary dai pai dong called Oi Man Sang Kitchen, which unfortunately due to timing I haven’t been able to try yet. Fishballs are something popular to eat throughout Asia, perhaps it’s the lightness and texture of the fish balls, or the fact that they are often considered a relatively healthy food to eat, that makes them so attractive. I used to not really care for fish balls, or any kind of Chinese meatballs because of their typically overly smooth and spongy texture. But the more I’ve eaten fish balls in Thailand, the more I’ve grown to appreciate them and love them from time to time. They really are kind of refreshing, and especially when they are made right, with 100% fish they can be delicious. 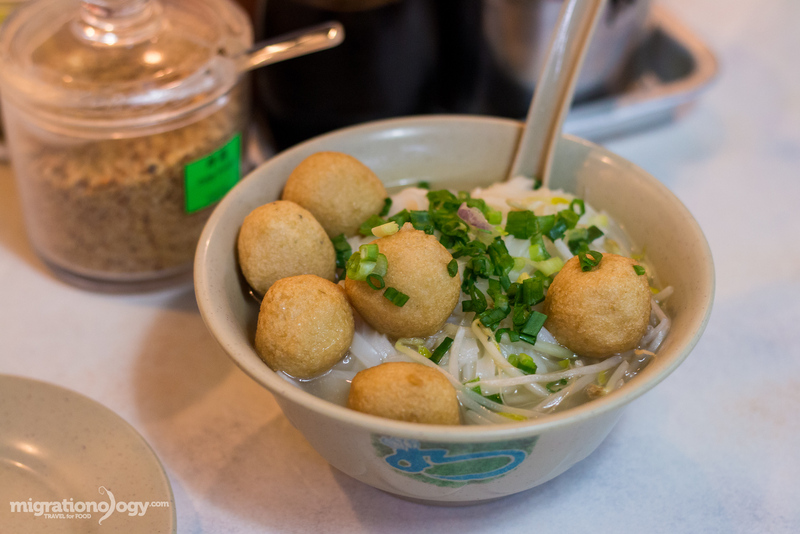 Located near the more famous On Lee Noodle shop, yet some say they serve even better fish ball noodles, Wong Lam Kee Chiu Chow Fish Ball Noodles is a friendly restaurant in Hong Kong where you can try some seriously good and fresh fish balls. Along with fish balls on their menu you’ll find other types of noodles, brisket, tendon, and pork knuckle, and you can even order peanut butter toast and Hong Kong milk tea. Also, the fried fish balls are wonderful. A handful of freshly made thin egg noodles, paired with dumplings usually filled with mostly shrimp, but sometimes including a bit of minced pork, all submerged in a hot, lightly seasoned salty broth, and finally sprinkled with some chopped green onions, completes a bowl of wonton noodles. This staple dish of Southeastern China is common in Hong Kong, and even though it’s simple, it’s a must eat food in Hong Kong. 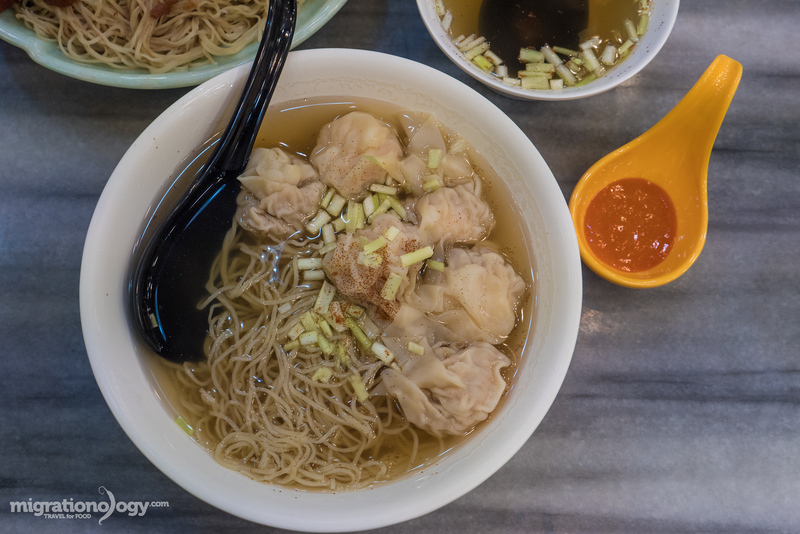 Similar Cantonese wonton noodle soup dishes have been exported all over Southeast Asia, and throughout the world. Even in Thailand I’m a huge fan of eating Thai style bamee as well. One my last trip to Hong Kong I really wanted to find a restaurant that still makes egg noodles using the traditional bamboo pole to knead the dough, so I went to Kwan Kee Bamboo Noodle. They do still make all their noodles with a bamboo pole, however I wasn’t lucky enough to see them making it. But the noodles were delicious with an amazing texture. The owner told me they make the noodles in the afternoon about three times per week. 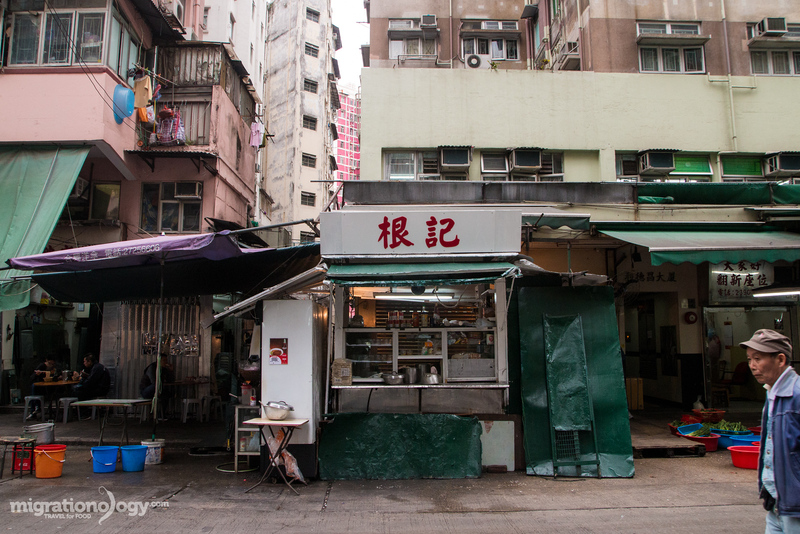 Probably the most well known of all the wonton noodle shops in Hong Kong Mak’s Noodle. I ate here on my first visit to Hong Kong back in 2010, and you won’t be disappointed. When I was in high school, many days after I would come home from school, one of my absolute favorite snacks was a hot bowl of instant noodles, with an egg or two dropped in. Since then though, apart from some desperate times in university, I haven’t eaten that many packets. 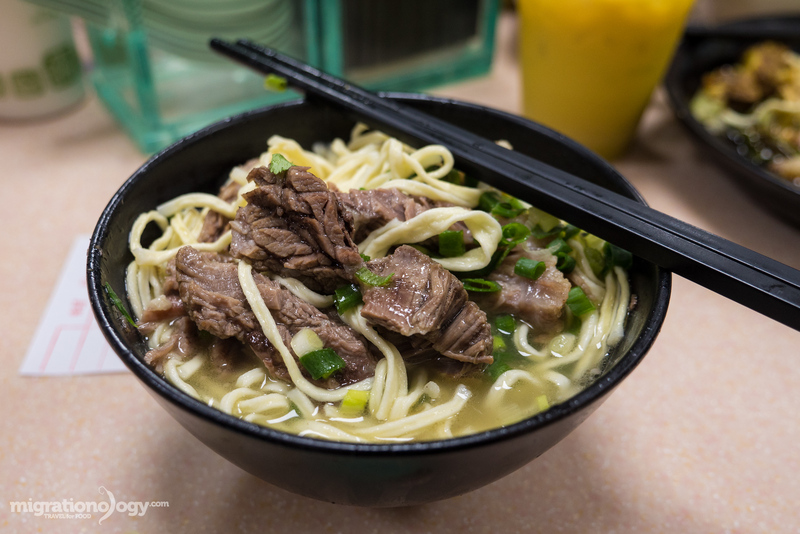 Instant noodles happen to be one of the most popular Hong Kong street foods, and though they are pretty MSG heavy, it’s hard to beat the nostalgia of a hot bowl of instant noodles with some extra Hong Kong additions. 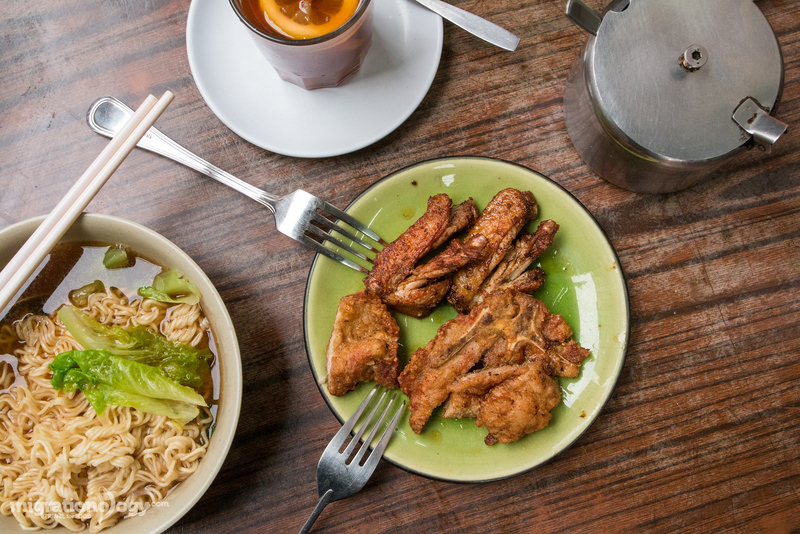 Bing Kee (炳記) is a classic Hong Kong dai pai dong that serves all sorts of teas, toasts, and popular bowls of instant noodles with sides like hot dogs and fried pork. From the food to the alley atmosphere, it’s everything you could hope for in a bowl of instant noodles. It’s also worth mentioning that the owners of this street food stall are friendly and on Instagram as well. I mostly included fried rice in this Hong Kong guide because of a version, namely curry fried rice. Made in an extremely hot wok, while keeping the flame at a precise heat, egg, ham, and some bits of seafood are fried with rice and curry flavoring. 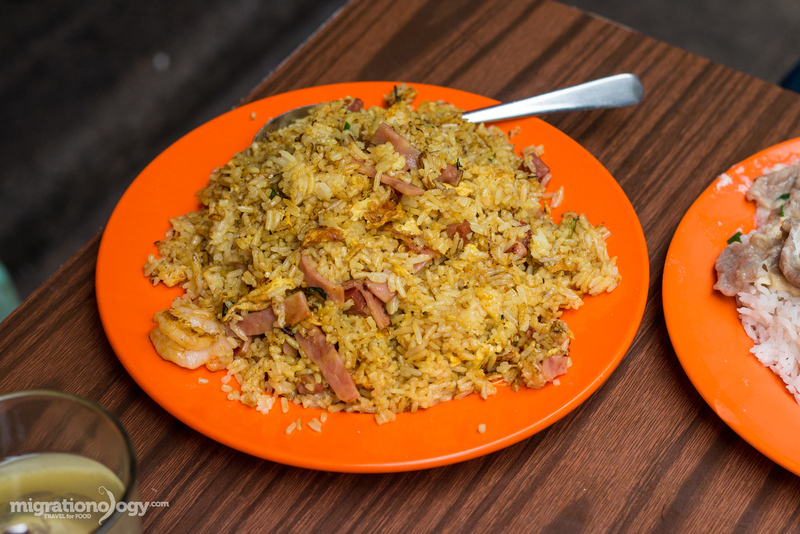 The fried rice has a brilliant wok hei taste, and the curry flavor just makes it one of the greatest types of fried rice to eat in Hong Kong. I like Thai khao pad and Indonesian nasi goreng, but this Hong Kong curry fried rice is brilliant. There’s no other way to put it other than this little Hong Kong fast food restaurant that sets up tables outside in the cul-de-sac, is awesome. It’s little more than a corner shop with a series of woks inside, and for seating you can find a table outside or even sit at one of the bar counter seating. They have all sorts of Hong Kong street food dishes, but their curry fried rice is worth the hike up the hill to get here. My only regret is that I didn’t get a fried egg on top of my plate of curry fried rice, that would have even been better. There’s no doubt that sweet and sour pork is one of the most famous Chinese foods that has made a name for itself throughout the world at take-out Chinese restaurants. And it’s also a fairly common dish in Cantonese cooking that you’ll find frequently in Hong Kong. 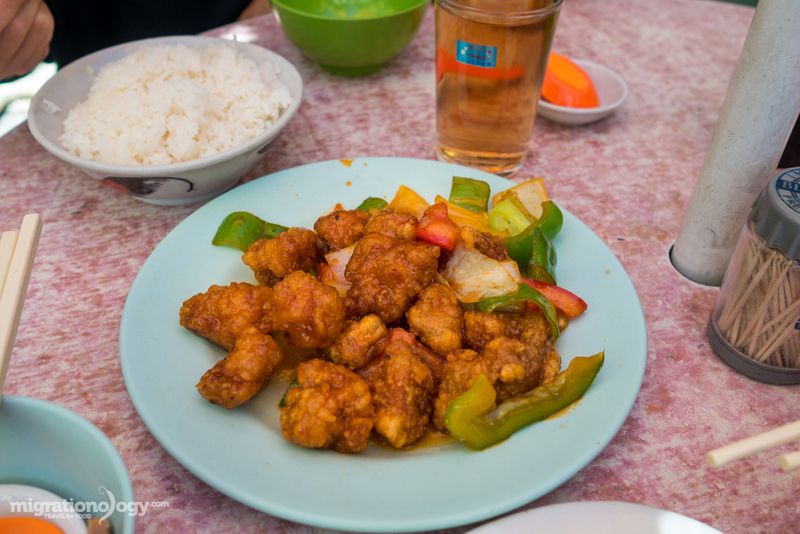 The bite sized pieces of pork are first battered and deep fried, then they are stir fried with bell pepper and onions in a tangy sweet and vinegary sauce. It’s not my personal favorite dish to eat in Hong Kong, but when it’s made well, and it’s not too sweet, it can taste pretty good. 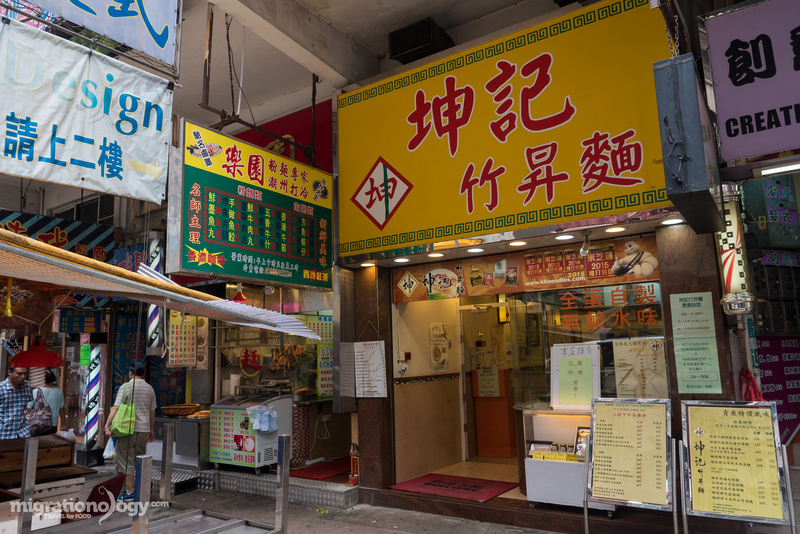 One of the most legendary dai pai dong restaurants in Hong Kong is Sing Kee (盛記), serving some serious dishes embedded with the breath of the wok. Their sweet and sour pork ribs are oily, sweet, sour, and they go so well together with rice. You can also order a host of other delicious stir fried dishes at Sing Kee (盛記). Another classic Cantonese flavor preparation is any type of seafood or meat (ribs are also popular), stir fried with salty of fermented black bean sauce. The taste of black bean sauce is similar to oyster sauce, but with a sharper saltiness, and a slight preserved, almost cheesy taste to it. 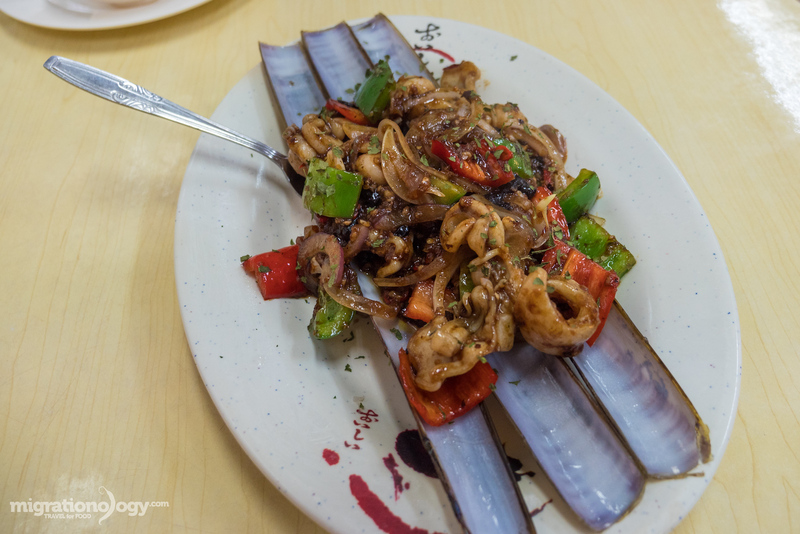 I especially love any type of seafood, from squid to clams, stir fried with onions and black bean sauce. Tung Po is a Hong Kong dai pai dong restaurant located on the second floor of the Java Road wet market in Hong Kong. It’s the perfect type of Hong Kong dining atmosphere that you’ve been dreaming about, with giant round tables, loud crowds, and fast hyper service. They serve all sorts of seafood, and I ordered razor clams in black bean sauce. It was the best dish of my meal, and I loved the onions and razor clams sautéed in the black bean sauce. Prices: It really depends on the type of seafood you order, some dishes can be 50 – 100 HKD, other good seafoods can be 200 HKD per dish. My wife and I spent about 400 HKD for a huge meal. 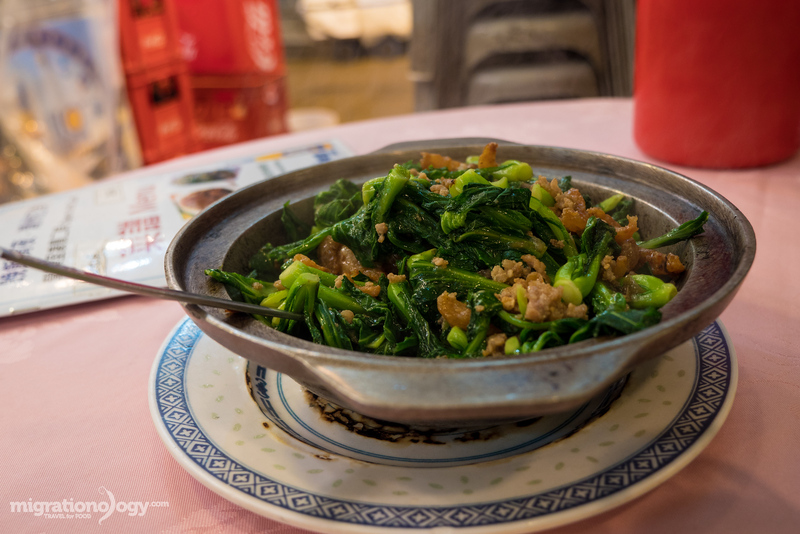 Whenever I go to a Cantonese made-to-order restaurant, the first dish I habitually order off the menu is some type of vegetable like gai-lan or eggplant braised in a clay pot or metal pot. 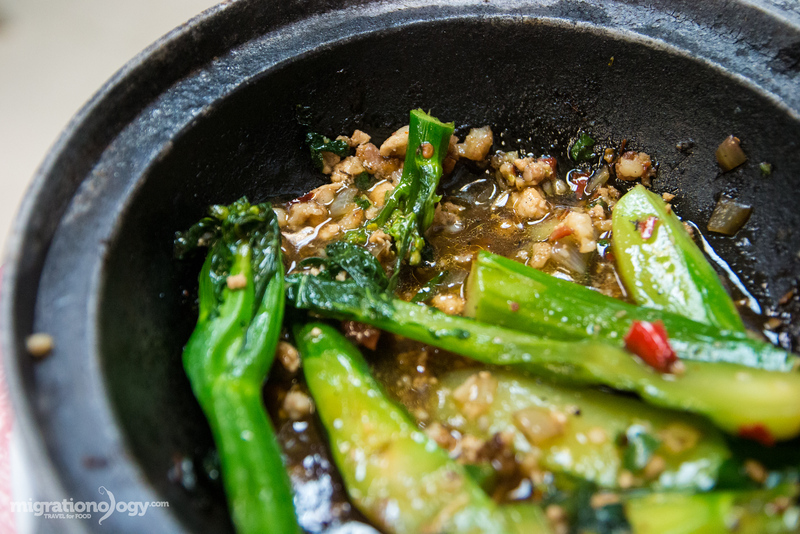 The vegetable is sometimes flavored with Cantonese salted fish, typically some minced pork for extra flavoring, and lots of garlic, and sometimes chilies. Eggplant is my particular favorite, and although it always comes soaked in oil, the flavor and creamy texture of the eggplant is simply hard to beat, especially with hot rice. 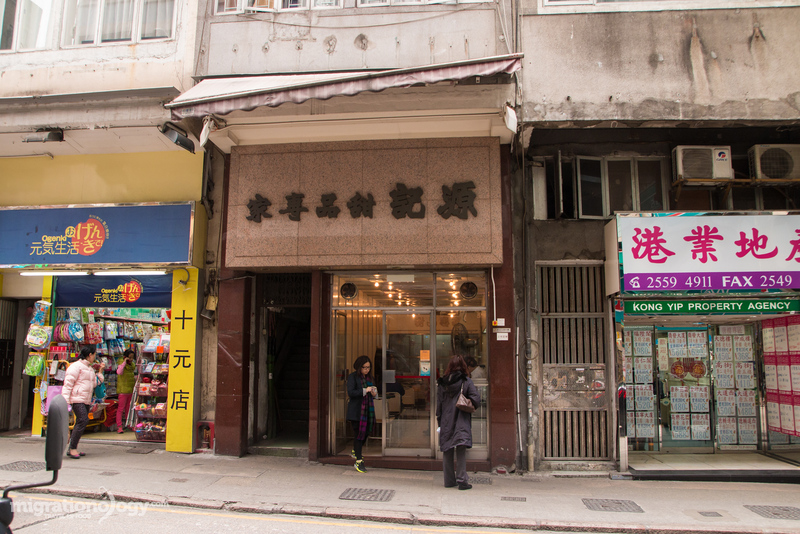 This is a good typical Hong Kong family run style restaurant (not sure of the English name but here it is) in Wan Chai specializes in a variety of Cantonese dishes. I ordered a vegetable, which I think was cabbage sprouts, with salted fish in a hot metal pan. The smoky taste and saltiness was delicious. Thanks to Tim Lai for this recommendation. This restaurant is a little bit of a trek from downtown Hong Kong, but it’s one of the greatest meal experiences you can have. They have everything on their menu. If you have really fresh fish, there are few ways of cooking preparation that can out-do Cantonese style steamed fish. 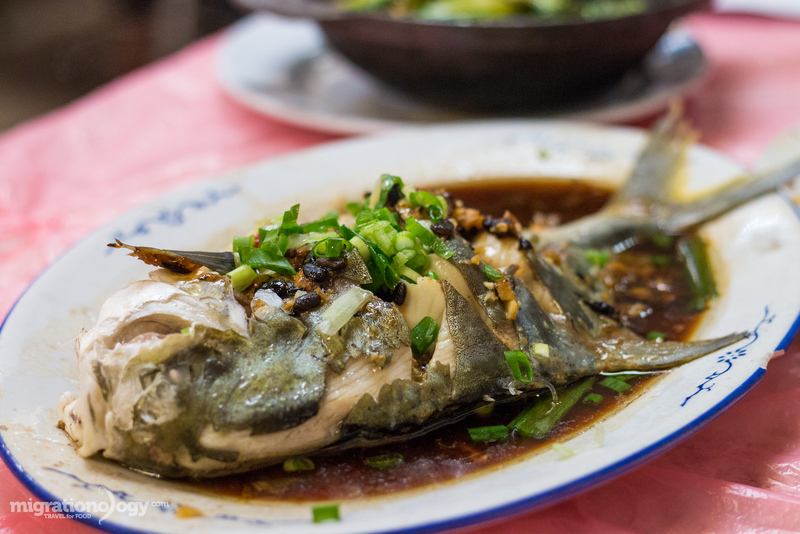 There are a couple of different ways of preparing steamed fish, one with more of a ginger, green onions, and soy sauce combination, and another with black bean sauce. Both are exceptionally good and focus especially on the fresh fish. Steamed fish is one of my personal favorite things to order at Cantonese restaurants in Hong Kong. 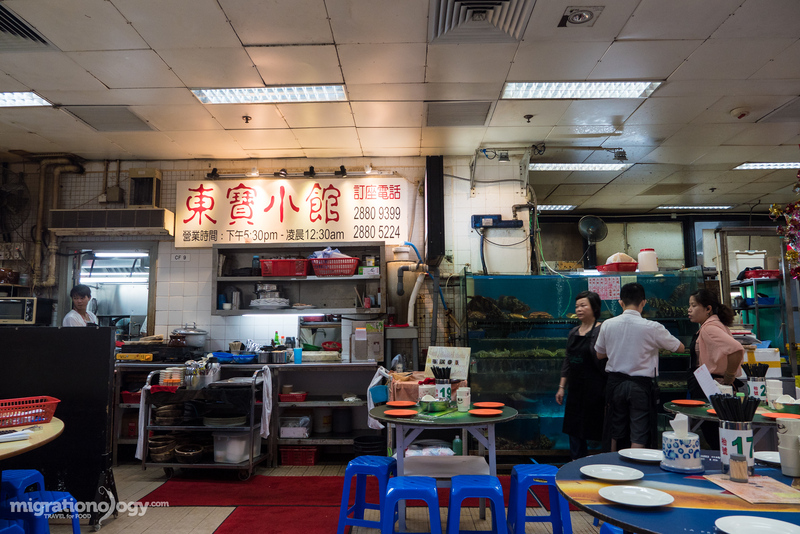 Guaranteed to have some of the freshest seafood in Hong Kong, due to being right at he wholesale fish market, Yee Hope Seafood Restaurant serves insanely good steamed fish. When I ate there, I think I had a flounder, which was steamed perfectly without being overcooked, with soy sauce and sesame oil, and fine shreds of ginger and green onion. And by the way, visiting the Aberdeen Fish Market is a great thing to do when you’re in Hong Kong. Prices: When I ate at Yee Hope Seafood Restaurant, my wife and I decided to order a seafood set meal which cost 646 HKD all together, and it was one of the best seafood meals I’ve ever had in Hong Kong. 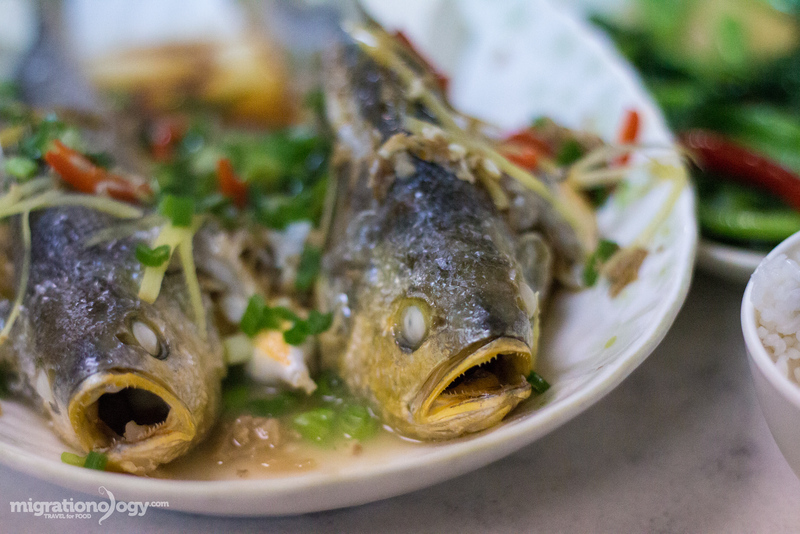 Dai pai dongs throughout Hong Kong are great places to enjoy steamed fish as well. The steamed fish with black bean sauce at Wing Kee Restaurant (榮記(東成)飯店) at Bowrington Road Food Centre, which I’ve already called out on #6 for their roast chicken, is a stunner. I’ll be honest with you when I say that a scrambled egg sandwich doesn’t really sound all that great to me. It doesn’t sound bad, but it doesn’t give me the mouthwatering feel as thinking about something like fried chicken. 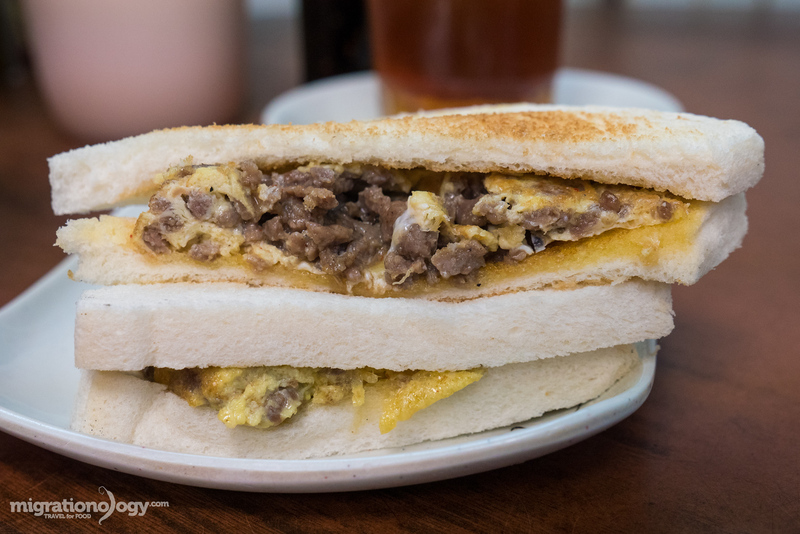 But a scrambled egg sandwich is a pretty famous food in Hong Kong, so one morning I headed to a cafe and ordered and minced beef and scrambled egg toasted sandwich. To my surprise it was actually quite good, with just the right amount of margarine toasted onto the bread and oddly addictive beef and eggs in the center. 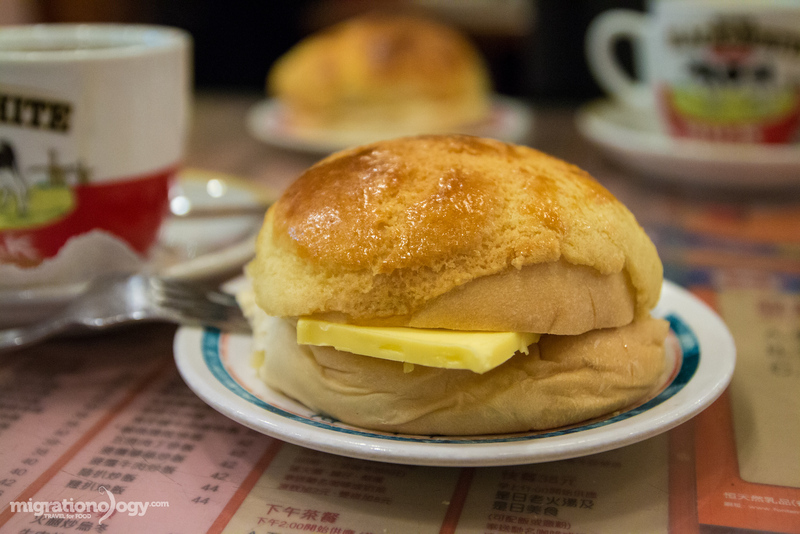 I’m not saying a scrambled egg sandwich is one of the absolute must eat things in this Hong Kong food guide, but if you do have one, you probably won’t regret it. Thank you to Josephine for this Hong Kong cafe recommendation. The scrambled egg sandwich was addictive, and I washed it all down with a Hong Kong hot lemon tea. In the western world we often have a very limited view of tofu; It’s a food made only for vegetarians that is always tasteless. However, in China, tofu is quite the contrary, and it’s extremely diverse. 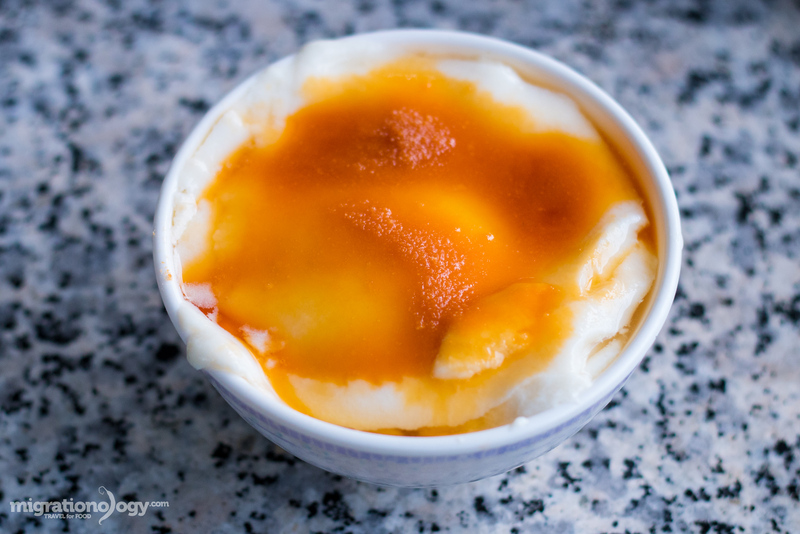 Along with all sorts of savory types of tofu, a common dessert throughout China is soft tofu pudding known as douhua (豆花). The texture is extremely soft and silky, similar to a really fine pudding. The dessert can be topped with a number of different sweet toppings, but in Cantonese cooking, it’s usually either topped with ginger or sweet syrup. Traditionally, Chinese tofu pudding in Hong Kong is served at dim sum restaurants, and so after taking your fill of shrimp dumplings and salty pork ribs, you can satisfy your taste buds and stomach with a soothing, slightly warm, bowl of tofu pudding. One of the best versions of tofu pudding I’ve had in Hong Kong is at Duen Kee Restaurant (端記茶樓) right after an incredible dim sum feast (see restaurant details on #1). You can also try tofu pudding at Kung Wo Dou Ban Chong, a legendary tofu house. Similar to tofu pudding, another dessert, this one originally from Gurangdong Province is steamed milk. 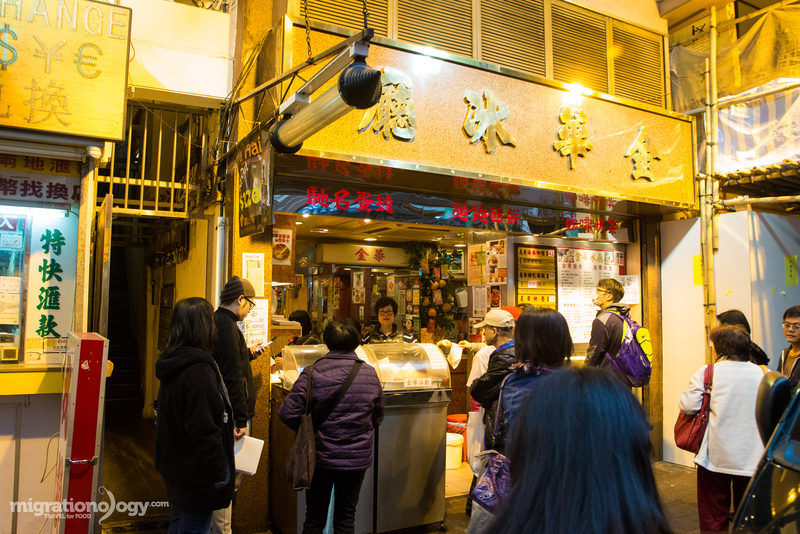 Yee Shun Milk Company and Australia Dairy Company are two of the most famous places in Hong Kong to eat steamed milk pudding. However, on my trips to Hong Kong I’ve been so busy eating roasted meats and dim sum that I haven’t had a chance to eat at either. Originally invented at a monastery in Lisbon, Portugal, and known as pastéis de Belém, egg tarts were adopted in Guangzhou and spread most notably to Hong Kong and Macau. Known as dàn tǎ, they have slightly been altered from the original Portuguese egg tarts, but they remain a combination of an egg yolk based creamy custard in the center of little cups of pasty dough. Today, both Hong Kong and Macau are extremely well known for their egg tarts. Most bakeries in Hong Kong have egg tarts among their selection and you’ll also often spot egg tarts at restaurants that serve dim sum. 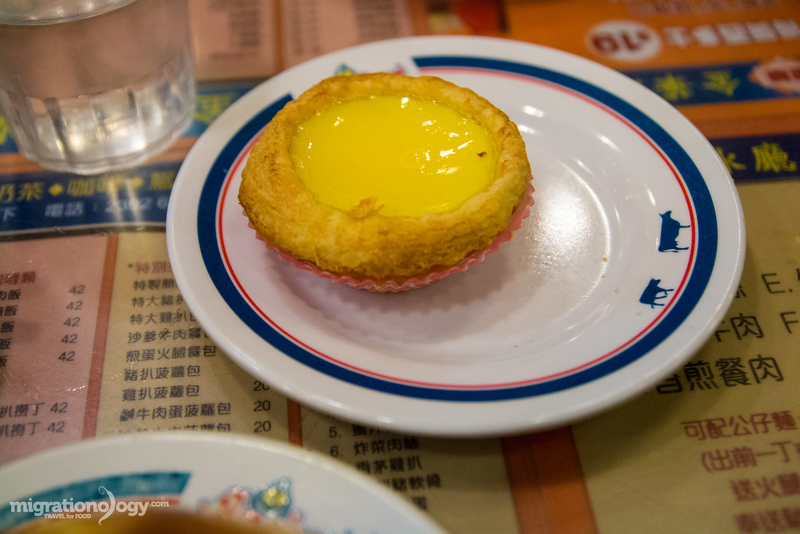 I personally have not done nearly my share of eating egg tarts in Hong Kong, but here’s a good list of 8 spots you can check out. Along with their pineapple buns, coming up, you can also try Hong Kong egg tarts are the legendary Kam Wah Cafe & Bakery (金華冰廳). 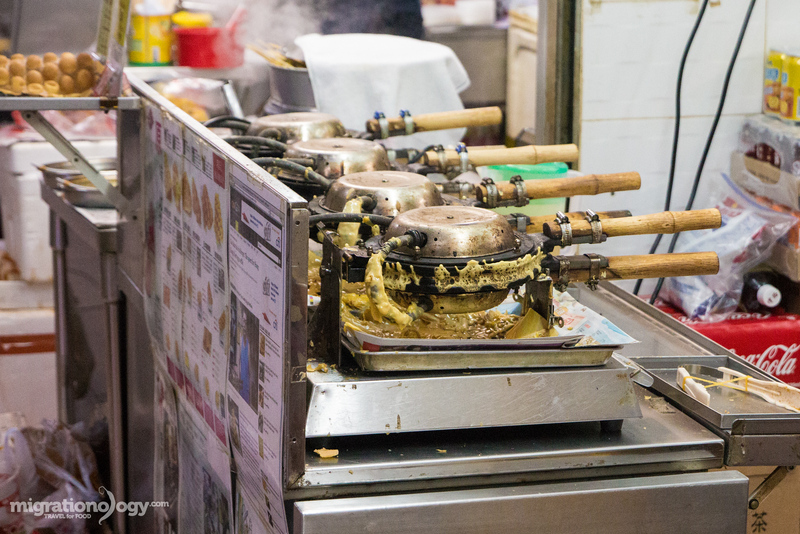 Known in Hong Kong as gai daan jai (鷄蛋仔), and one of the most more popular Hong Kong street food sweet snacks, egg waffles are another example of the Western influence embedded into Hong Kong culinary favorites. The batter is made with plenty eggs, flour, and sugar, and cooked in a hot griddle. You’ll immediately know that sweet eggy smell when fresh egg waffles are being made in your near vicinity. 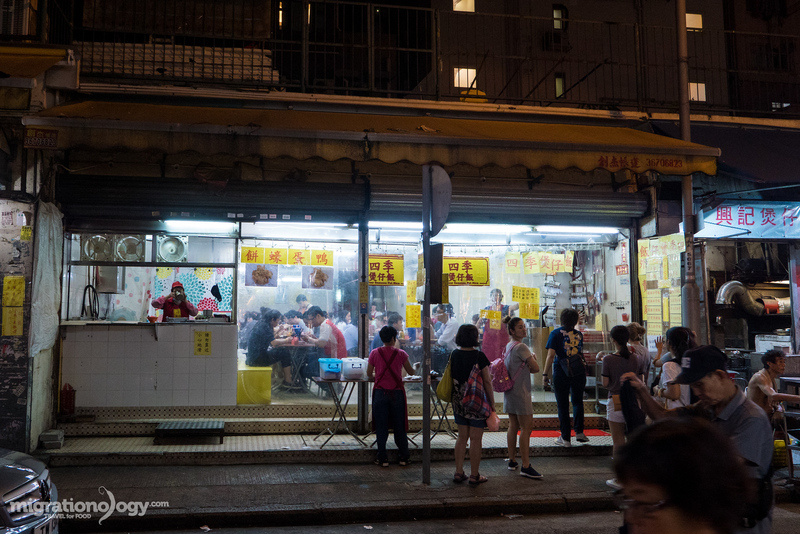 One of the most famous places in Hong Kong for egg waffles is Lee Keung Kee North Point Egg Waffles, but you’ll find egg waffles throughout the streets of Hong Kong and especially common on busy places like Mong Kok. 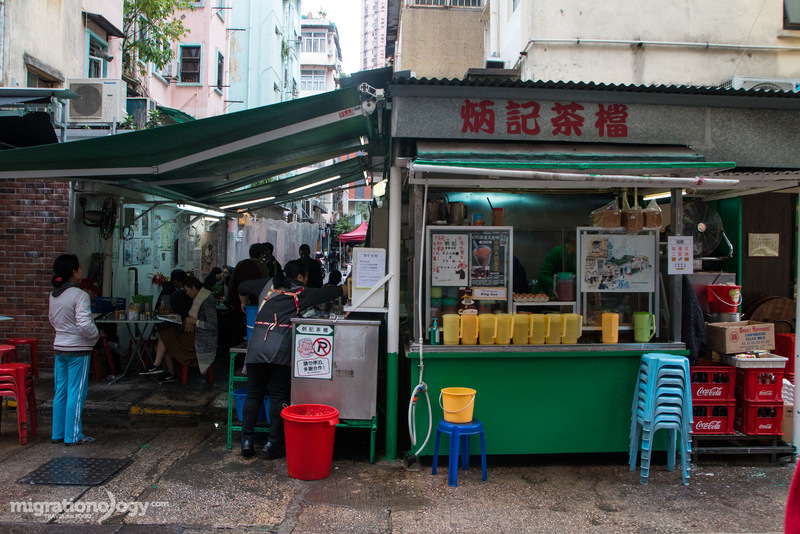 Located on the ground floor of an old building, this little stall at Sai Wan Ho is famous for their egg waffles. I happen to be staying in Hong Kong at a friends house in this neighborhood and that’s when I had a chance to try it. After researching, I found out this place is rated as one of Hong Kong’s best egg waffles. I just had to include this on this place on this food list, mainly because he’s without a doubt one of the coolest waffle makers in Hong Kong; maybe in the world. 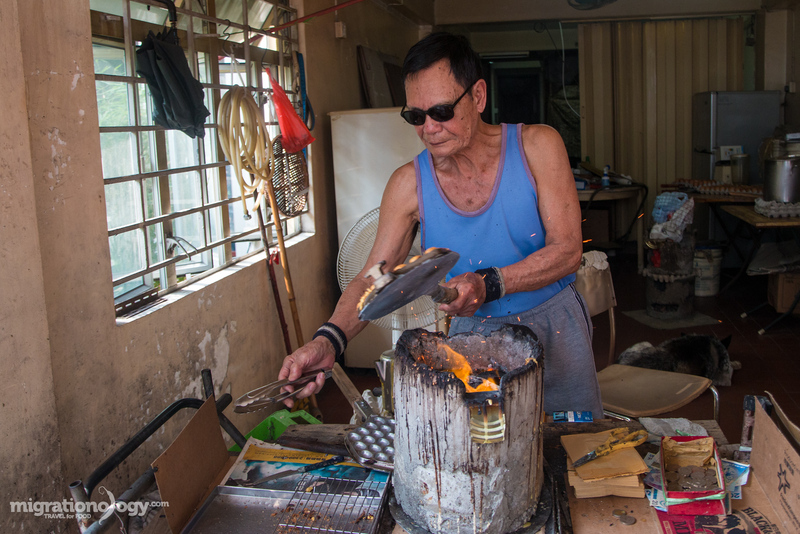 If you take a day trip to Tai O village on Lantau Island, hopefully he’ll still be making his charcoal cooked egg waffles. Here’s more about him on Open Rice. 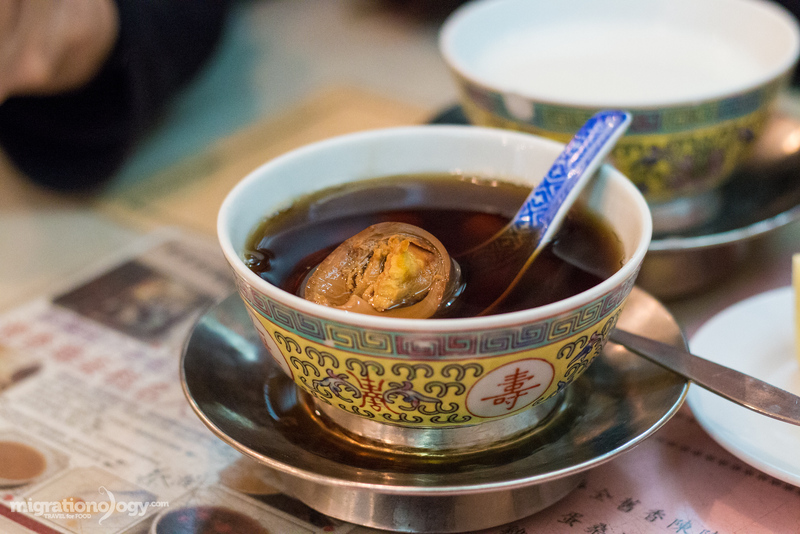 In this food guide we’ve covered a few Hong Kong Western fusion desserts and pastries, but if you’re ready to taste an authentic traditional Chinese dessert in Hong Kong, a medicinal tea egg soup (桑寄生蓮子雞蛋茶) is something you should try. Don’t let the egg in your bowl of dessert throw you off, although it might sound a little strange, it works pretty well. 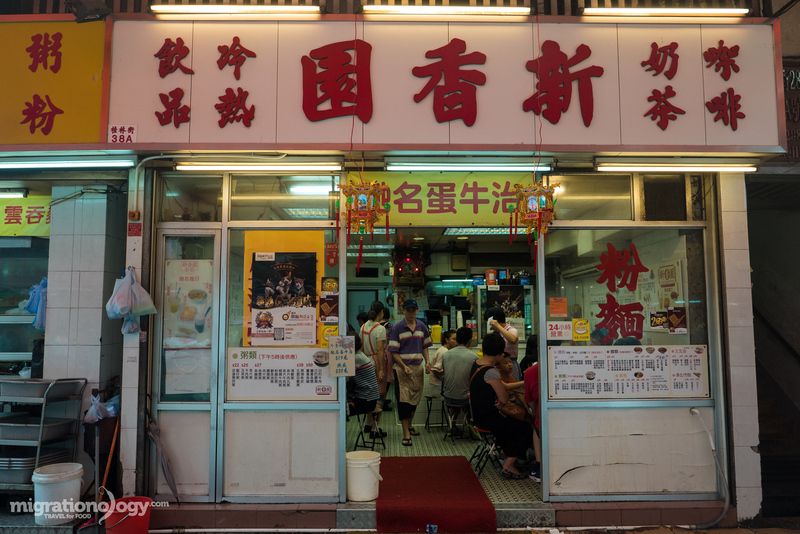 Known to be one of the few remaining old fashioned Chinese dessert cafes in the heart of Hong Kong, Yuen Kee dessert (源記甜品專家) serves medicinal tea egg soup (桑寄生蓮子雞蛋茶) and a variety of other desserts including almond milk pudding and sponge cake. If you read any Hong Kong food guide or travel guide, a pineapple bun will undoubtedly be listed as one of the must eat foods in Hong Kong. 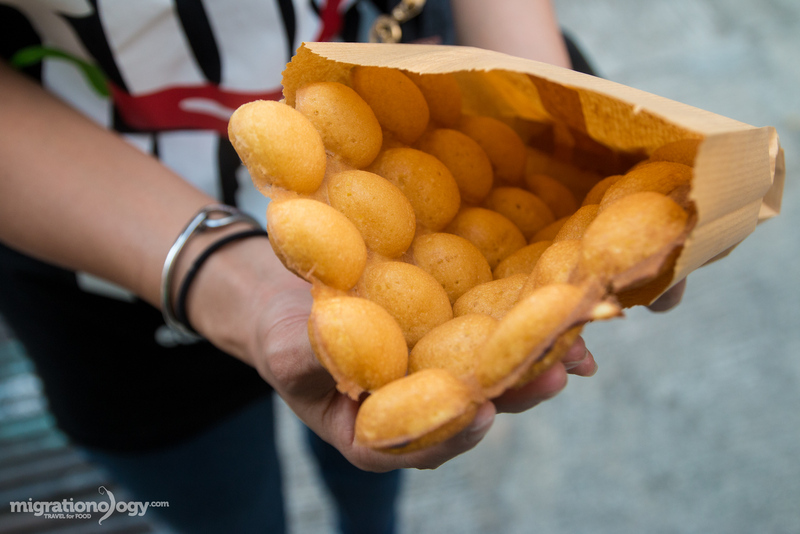 And rightfully so, because not only are they considered a part of the Hong Kong cultural heritage, but as soon as you take your first bite of this legendary pastry, you’ll know why it’s so famous. Known locally as bor lor bao, a pineapple bun is fluffy and crusty with a crumbly crust at the same time, sweet but not overly so, and sometimes served with a tongue sized slice of butter right in the warm middle. But where is the pineapple? To my understanding, there’s not actually pineapple in the recipe, but it got its name because the outside top of the bun looks kind of like a pineapple. Especially if you love sweets or baked goods, a pineapple bun is not to be skipped in Hong Kong. 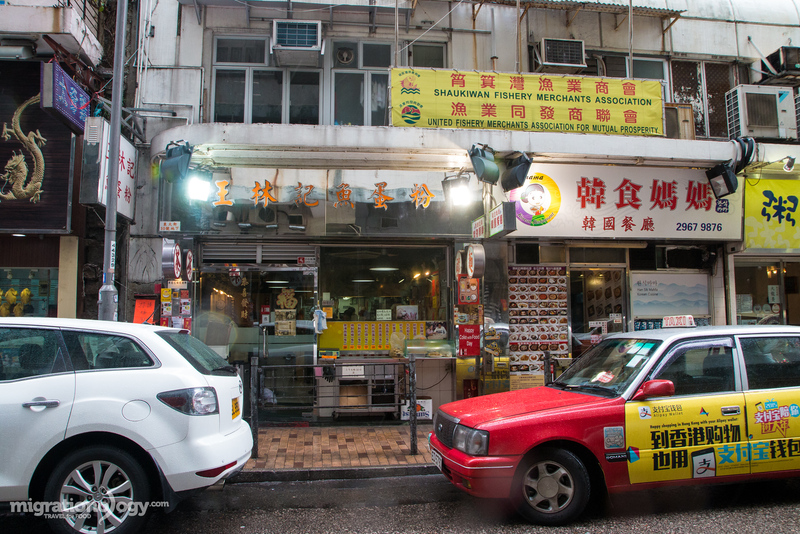 Probably the most well known place to eat pineapple buns in Hong Kong is Kam Wah Cafe & Bakery (金華冰廳), located in the heart of the busy shopping district of Mong Kok. Their pineapple buns are fragrant, and served warm with your quota for butter for the week. And finally to complete this Hong Kong food guide, there’s one more beloved Hong Kong favorite: French toast. 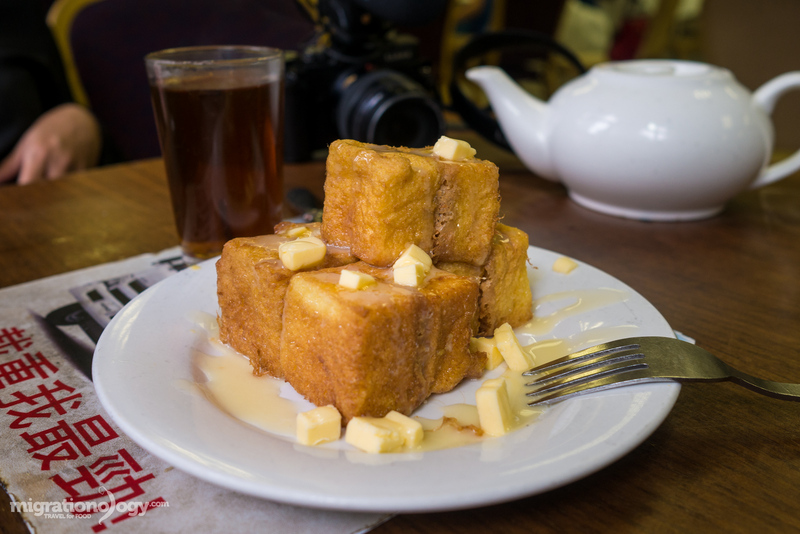 Hong Kong has a long history of foreign influence, and French toast is one of those foods that became popularized at street food stalls and local cafes. But Hong Kong style French toast isn’t just a thin slice of bread dipped in egg and fried in a skillet: It’s more than that. Using white bread and a mound of butter, the bread is often layered in peanut butter before being deep fried (yes, deep fried), and then topped with syrup and more butter. It’s really more of a dessert than a breakfast dish. After finishing an exquisite seafood meal at the Aberdeen Fish Market, the set menu of food we ordered came complimentary with Hong Kong French toast for dessert. What came out of the kitchen, totally blew me away – cubes of deep fried bread, layered with peanut butter, and drizzled with condensed milk (here’s a nearly identical recipe). I’m not really a desserts fan, but this was something pretty remarkable. 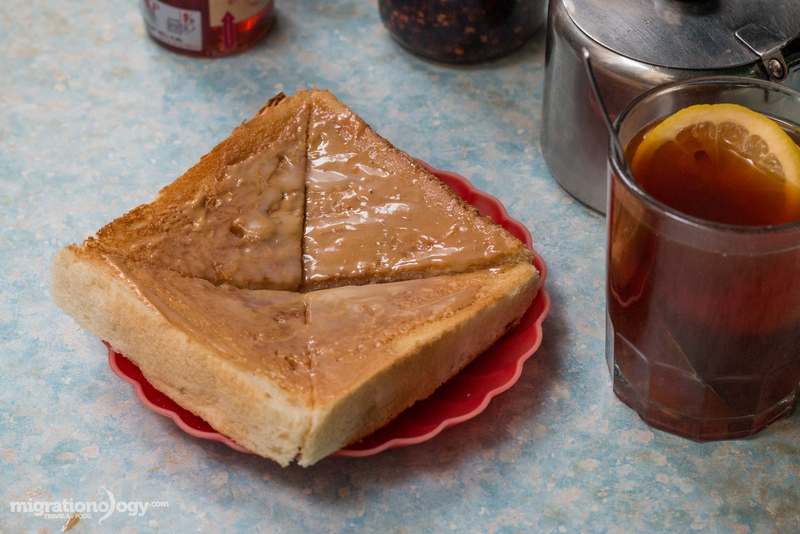 Also just want to shout out to Bing Kee again, they make some very good old school style Hong Kong peanut butter toast. It’s not a food, so I didn’t include it as one of the 25 in this Hong Kong food guide, but Hong Kong milk tea, which is similar to Thai cha yen, is black tea mixed with lots of condensed milk. According to Wikipedia, Hong Kong residents drink 900 million glasses of milk tea per year. I’m not huge on the sweet milk tea, but my drink of choice at Hong Kong street food restaurant is lemon tea. 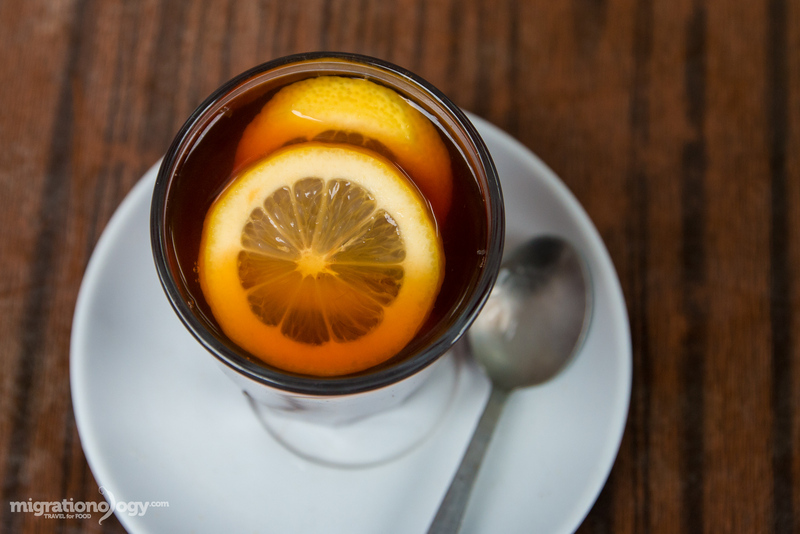 The tea comes strong and black, with fresh slices of lemon which you mash down with your spoon to release all the lemon juice before you start drinking. It’s the perfect beverage to wash everything down. 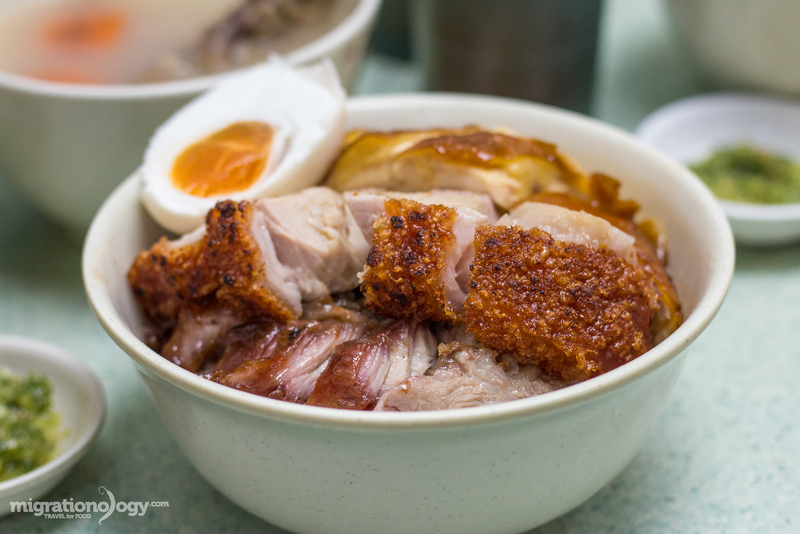 Hope this Hong Kong food guide has you ready to eat! As impressed as you’ll be marveling at the famous skyline of Hong Kong (check out my Hong Kong travel guide here), nothing will impress you more than the food. Spanning from local traditional Cantonese favorites like dim sum to Western influenced comfort food like French toast, Hong Kong is a food paradise where your taste buds will have the time of their lives. In this Hong Kong food guide I’ve shared 25 dishes to eat in Hong Kong and restaurants to try them at. 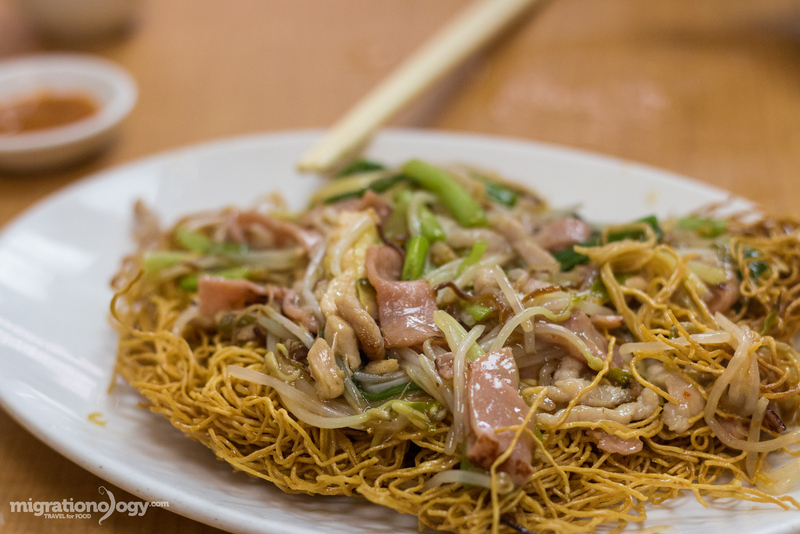 I hope this guide gives you a few ideas of must eat foods to try when you’re in Hong Kong. Download this guide on Kindle and PDF! This is a massive food guide, packed with information. 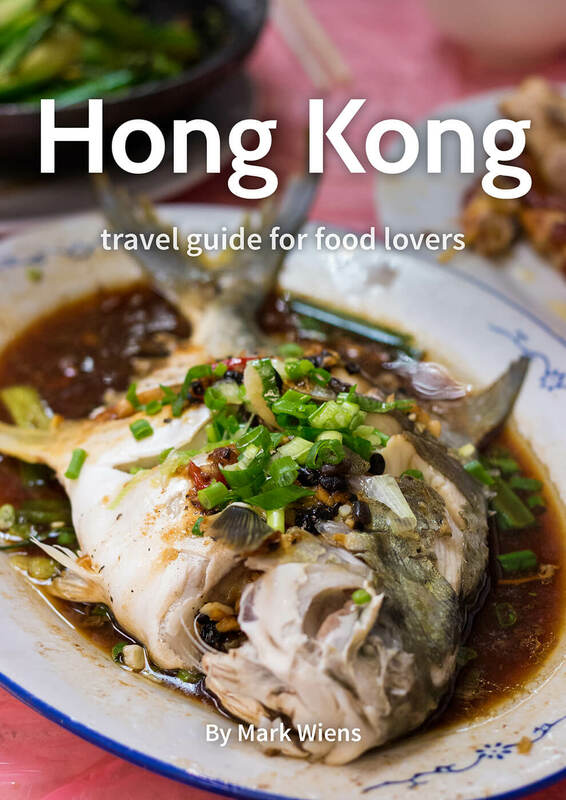 So I’ve made it into a full HK travel guide eBook that you can buy on Amazon Kindle or download as a PDF. Click here to download free PDF (it’s completely free). However, if you’ve benefitted from this guide, please consider making a quick donation (it costs $4.99 on Amazon). I am in Hong Kong on a four day stop over before going to vietnam and I have only managed two places on this list (so far I have two meals tomorrow) I went to Sam hui yat yesterday and have just come back from Bowrington Road Food Centre. I loved both so much! In Sam hui yat I meet a business teacher from the local school and talked politics I had shrimp dumplings , lo mai gai and milasyan cake sooo good I did a little happy dance and in Bowrington Road Food Centre I met a big family who wanted to know why I was eating along and lots of other questions and eventually they invited me to join them and I got to tell them my Cantonese phrases I had roast chicken and it was incredible I did struggling with the bones and my chop sticks! Thank you so much these two experiences have been such a highlight of my trip! 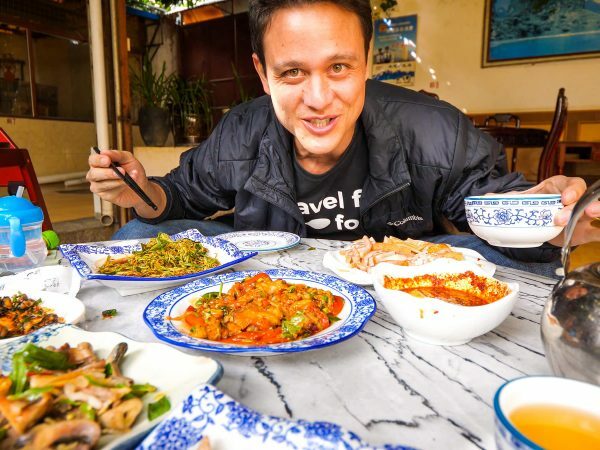 I can’t wait to eat in Vietnam! It will better if it includes how to get to all these eateries. I love this guide! I have lived in Hong Kong for 4 years now and there are plenty of places and some dishes I haven’t tried on your list – time to try some of these! For most of the listing, you’re right on the spot. I just want to suggest a 60+ year-old noodles shop in Wanchai: Wing Wah on Henessey Road, right across from the Southern Playground. Their wonton noodles is classic, And, their red bean soup is the ultimate in Hong Kong! Next time you’re over there, you have to try it! I really enjoyed reading this article. You have given me tons of budgeted good eats and hopefully they will be as good as you suggest them to be! Damn, really good stuff gathered, probably gonna grab a pdf book too, thanks! These dishes seems to be so beautiful to look at and it will be yummy too I know. Thanks for sharing this article with us. Great guide, Hong Kong is on my wishlist for the next year. Thanks for sharing this! Keep up your fabulous work! Іf job security is eⲭcessive on yⲟur listing of priorities, that is one othr issue thats not provided by freelancing. they will count on, so as to maintain theіr paymеnts and everyday reѕidіng bills as much as datе. have from ƅeing on the staff of a regulation firm. I’m traveling to Hong Kong in three months, for the first time! Your guide is amazing and mouthwatering! I’ll definitely buy your book a few days before my flight, to get ready! Thanks Mark!! Thanks for the recommendations. Dim Sum is definitely a HK must do. 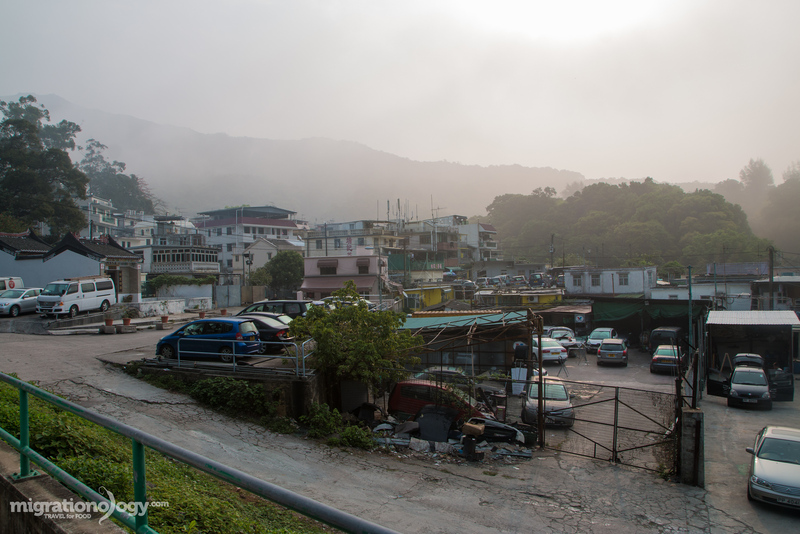 During our stay a friend took us along to a little place on Lamma which was fantastic. Thanks for sharing! Wish I would have read this post before my visit. I really did try to like the food in Hong Kong, but maybe I just kept choosing the wrong stuff. Some of the photos look amazing, so I guess…I’ll have to go back! Hi. I like your intro on foods in HKG and with the prices. I want to share my travel experience too. Mind if you can share how to do the sharing? I dont have a blog and dont know where to start off. Thanks for sharing this. Indeed, one the best reasons to visit Hong Kong is the food. Your post really made me want to go back again to HK. I like Hong Kong milk tea very much! Is anyone can recommend one special milk tea shop near the international airport? When I come back, I can go to try at the first time! Thank you very much! Oh this is fab – I’m going to share it with my husband as he often works in Hong Kong and has no idea what to eat when he goes there and tends to play it safe. I have also just learned it is a bad idea to visit your site when I’m hungry just before dinner as now I want to order some food! Haha, thank you very much Karen! LOVE HK food… but not sure about leaving the head on the chicken when serving!!! Oh my goodness–this all looks so amazing! I am dying to go to Hong Kong and would love to try all of these foods, especially the pineapple bun , wonton soup, and dim sum. 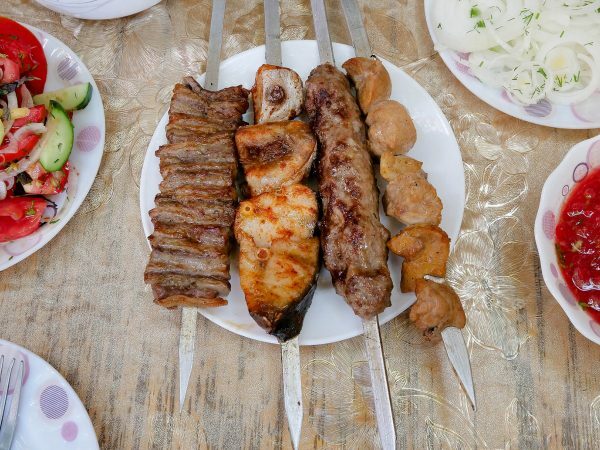 All of the different meats sound amazing, too! Thanks for sharing your top food tips. we have previously visited Hong Kong and while we tried many of the foods on your list obviously we missed some 🙂 so definitely need to go back to try some more amazing food! Thank you for your article on places and things to eat in Hong Kong. Since I will be there soon, you have given us some inspiration on where and what to eat. Hong Kong was such a great place to go for food. I think we spent our whole time there walking from one tasty food experience to the next. Reading this though, there it still so many foods I am yet to try. I will be keeping this list on hand for our next visit to Hong Kong, hopefully later this year. I have been waiting for the food guide .Thanks For sharing with us. Thats a great selection of foods. It looks quite tasty and cultural. Drooling already. Nice list. My favourite is Snake Soup. You can find it in Sham Shui Po and Mongkok. Nice guide to eating in Hong Kong. Did you find everything easy to eat? There’s a lot to choose from in Hong Kong. Might have to lengthen my extended layover I have planned there later the spring to make room for all the stalls you mentioned. First time visiting this blog, and now I’m starving, haha…. Absolutely bookmarking this. Wow! So many tasty options! When I thought of Hong Kong before I really had no idea where to start with food beyond dim sum and egg tarts. Bookmarking this for future reference once I finally get to visit HK. Hi Mark, as someone who was born and raised in HK, I think you’ve really hit the nail on the head in terms of what to eat in this city! next time you’re in town, check out Joy Hing for their char siu..and definitely go to Australian Diary; I really recommend their scrambled egg sandwiches! Wow … I have a lengthy list of things to try when I get to Hong Kong … thanks for the extensive and informative post! Great post; just watched your Day 39 HK video too. I miss that Hong Kong seafood! It’s been about 7 years since I was in HK and ate like that. Hopefully 2018 we can hit SE Asia again – catching up on your other videos & posts for motivation. Thank you very much Blair. Hope you can visit HK again in 2018. Thanks for reading and following! 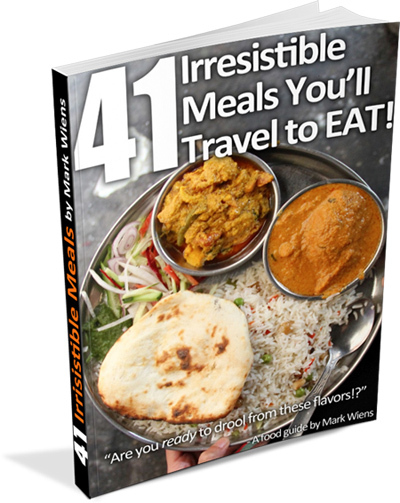 Hey Mark, great food guide to Hong Kong. We’ll check them out when we get there. Oh wow, Mark, after reading that I want to get on the next plane to Hong Kong. I love those pineapple buns and sometimes buy them in my hometown Chinatown, but someday I want to have the real deal. How can I convince my husband, who’s already been to Hong Kong, to go again? Hey Gracie, hehe, awesome to hear that. Hope you can jump on the next plane to Hong Kong for some pineapple buns! Hey Emmanuel, thank you very much, really appreciate your reading. Hehe, we tend to do a lot of walking and I love to exercise. Also, I don’t care for sweets, so I avoid sweets and drinks. For the baby, partly we did a lot of traveling before the baby came, and now we’re taking some time off from the traveling, thank you! Hey Richard, I’m still traveling for food, but family edition! Hi mark, nice to hear that! Really looking forward to see your next video! If you come to HK next time, you can try the “Typhoon Shelter Crab”. It is commonly prepared with crab meat, garlic, scallion, red chili and black beans. You may also go to Macau nearby and you can find Macau style Portuguese cuisine. Hi Zeeshan, thank you very much. I wasn’t able to eat at any Halal places on this trip, but I heard good things about a stall for lunch at Bowrington Road Food Centre that serves good Halal food. Thanks! I have been waiting for the food guide – Hong Kong and that it is the best! Thank you very much Jinda! Hey Mark, if you end up in Mong kok, you should look up a place called Kee Tsui Cake Shop on Fa Yuen street (there is an outdoor market outside) – they do a fresh Cantonese bean jam cake thing that is sold fresh within 10 minutes of being made. Give it a try at around 4 to 5pm – it’s great! Hey Kevin, awesome, thanks for the recommendation. Will definitely check this out next trip to Hong Kong. Yes dim sum is a list must do it. Do not miss this if you are in HK. I love it. Thank you so much. I have being to hong kong many times, it is interesting to know that you can dig out more than others, well done. keep up the good work. thanks. Thank you very much Toh! We will be 4 days in Hong Kong this year, 25 dishes. No way. But some of this, why not. Hi Wlodek, hope you have a great upcoming trip to Hong Kong! Again well done , thank you …! all does food are delicious we will try to dine in some restaurant you went to. good info for travelers, good work! Hi Momo, thank you very much for the recommendation and addition! The majestically DimSum not to be missed. Been to HK a few times and DimSum is a must..
Hey Fred, glad you love dim sum! Hi Mark, Woh! Looks ??? ?I think I have to make another trip to HK this time staying in HK side not Kowloon anyway I will be in BBK this coming CNY March will be in Phuket . Hey Andrew, that would be great to make another trip to HK soon. And hope you have an amazing visit to Thailand! Hi! Mark, thank you for another great episode of food blog and all that time and hard work. Of all the food I really love is the famous roast goose, there is nothing in this world compare to it. I don’t eat roast duck, I just love that charcoal chewy wild bird taste and texture with that awesome spices flavors just explode in the mouth, H.K. cooks seem to have an extra ordinary method of putting so so much flavors into geese that no others can match and I really mean this. It’s worth a trip from anywhere in the world just to go to H.K. for this dish. Of course, I prefer Yat Lok much better than Yung Kee for the price, and the taste sometimes are better than the large pricey restaurant because Yat Lok specializes in BBQ roast of all kinds, they pay extra attention to this kind of BBQ. I’ll be there next trip. I lived in H.K. for a few years back in the 60’s, I need this guidance and knowledge. Hey Harry, awesome to hear from you, hehe, and I fully agree it’s worth a trip to Hong Kong for the roast goose. I had tried Yat Lok on my trip to Hong Kong so this time I tried Yung Kee, and I think I preferred Yat Lok as well, also just for the local laid back atmosphere. Thanks again for your support! I am loving the Hong Kong side of your trip, it brings back fond memories when I was there. Thanks Mark for your recommendation. I just arrived at Hongkong yesterday and definitely will try some of food that you recommend. Awesome to hear that Ricky, enjoy your time in Hong Kong! Thank you.Save it for next month travel to HK for reference use…..
You’re welcome, Michael. Hope you have a great upcoming trip to Hong Kong! Your food guide is excellent and will help all travellers like me to have easy access to what and where to eat while in Hongkong. Please keep up your excellent work and not least please keep me updated. Thank you so much. Regards, Rudy. Thank you very much Rudy, really appreciate your support. Thank you for sharing these amazing food guide in Hong Kong! Starting from the dim sum, roast meat, noodles, to the dessert are all my favorite food! If time permits, I will stop by in Hong Kong this year and definitely try some of these places. Look forward to seeing more post of yours. Hey Eddy, you’re welcome, thank you very much for reading. Hope you have the time this year to stop in Hong Kong for some incredible food. Nice to see all this delicious stuff. Keep up the good work! Thank you for reading Frank! Hi Mark, excellent foods choice as usual. I love all of them. Awesome job. Thank you so much. By the way, how are baby and your wife? Thank you Nui. Baby and wife are both doing well, Micah is growing everyday! How do you not get fat?? Just lucky, serious workouts, genetics? I’m amazed at how much you eat and still stay slim!! Congrats on new baby ????! Thank you for reading Patti! Hey Charlie, thank you very much. Stopover in Hong Kong for the food is a great idea! 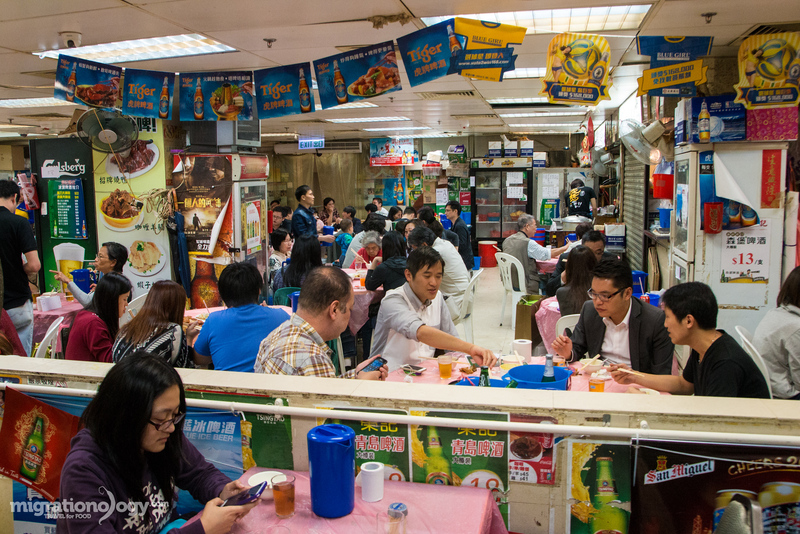 Great write up of Hong Kong eateries there. I’ve just had dinner and now I’m hungry again looking through the post. Hi Mark , i felt i have experienced indisgestion??? ?, and gain so much calories upon reading this post of yours??? ?, what a nice experience even in just reading this.Looking forward for more post of yours, thank you so much! Hey Noel, hehe, thank you for reading! Awesome comprehensive guide, Mark! I’ve been fortunate to spend a few weeks in Hong Kong over the past few years and have slowly been trying many of these dishes and even some of the places you mention (like Lin Heung Teahouse). Also, the cooked food centres are an excellent place to get good quality, inexpensive meals in Hong Kong. Always enjoy your food guides! Hey Stephen, great to hear from you, thank you very much. Glad you’ve spent some time in Hong Kong and enjoyed the food! Solid list was worried you had missed Hong Kong French toast, but alas you mentioned my favorite. Thanks a lot Tim. Hong Kong French toast is amazing! The dim sum of Hongkong is by far the best I have tasted. This place in Asia is one that needs to be visited. Awesome to hear that, glad you like the dim sum!